Rockstar had been busy releasing REMIX versions of previous game modes but even with Red Dead Online being their main focus, Rockstar managed to squeeze out a new DLC: Arena War. 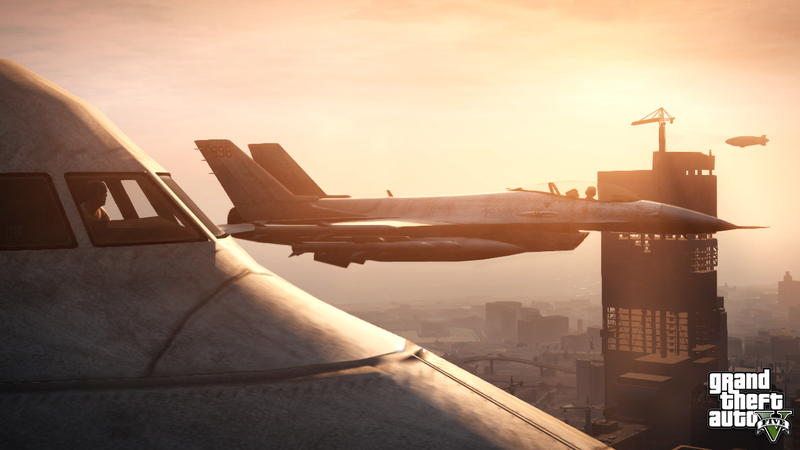 The mode brings apocalyptic vehicle battles to the Maze Bank Arena. Following various vehicle and game mode releases, Rockstar Games introduces GTAO: After Hours which brings new adventures to the Los Santos nightlife. After the release of the Annis Savestra and Lampadati Viseris, the Grotti GT500 sports car and Air Quota Mode are released. 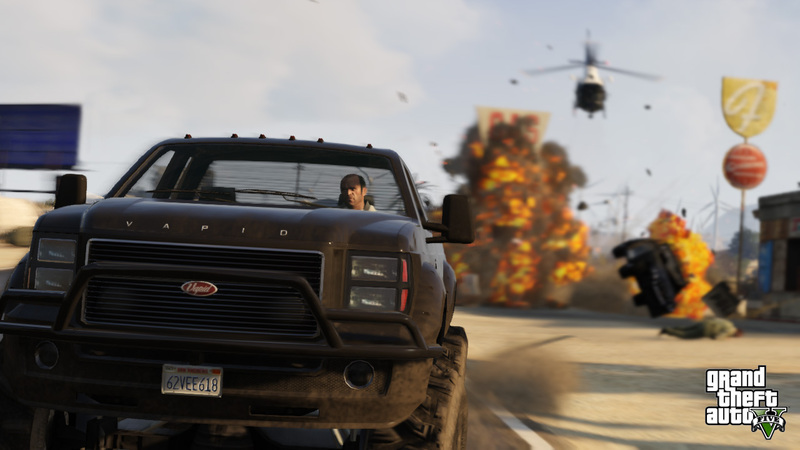 The Doomsday Heist offers a new way to save San Andreas and the world. The heist involves 3 acts while you and some powerful people fight off other powerful people trying to take over. 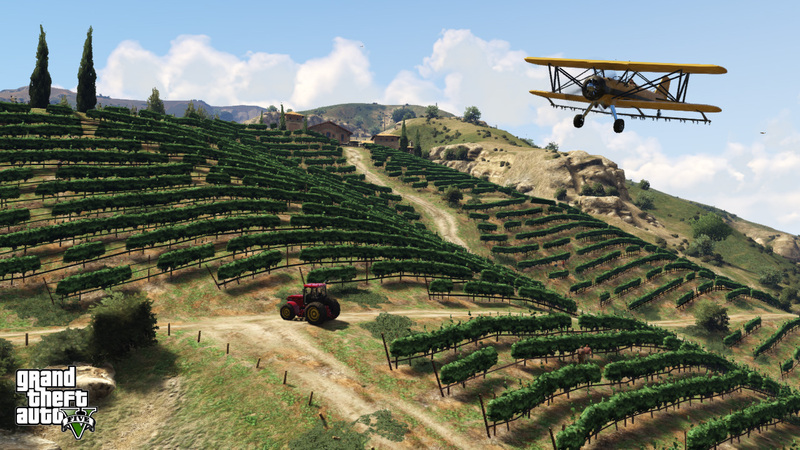 More vehicles and aircraft were released for Smuggler's Run and then Transform Races became the new way to drive, fly, and drive again around GTA Online. Later in the month Halloween returned. 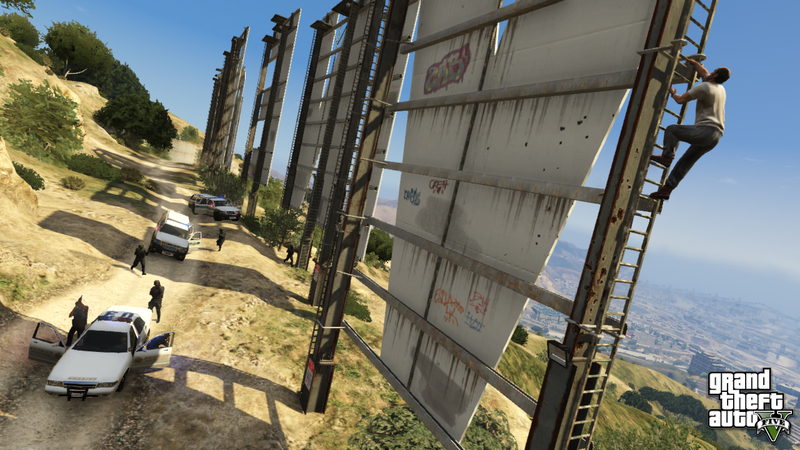 After numerous vehicle releases and new adversary modes for the previous DLC expansion, Smuggler's Run is released for GTA Online. Another new Adversary Mode: Dawn Raid plus the Vagner Supercar and the return of Independence Day specials. Billed as an Adversary Mode, Tiny Racers takes stunt racing down to a smaller level. 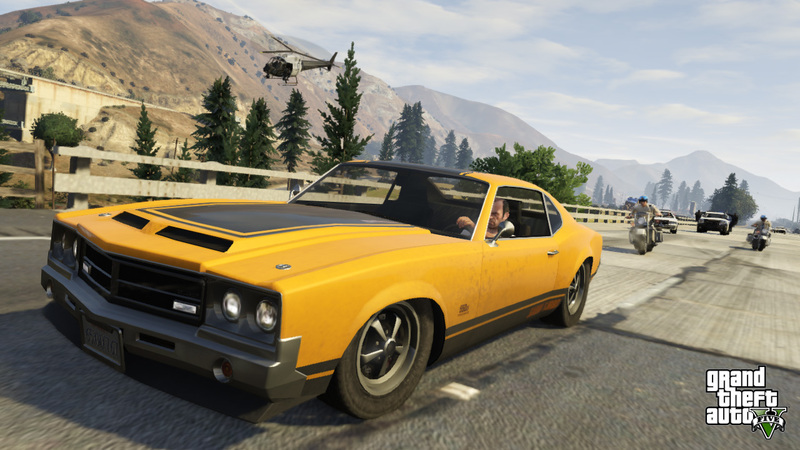 Once special for returning players in story mode, the Duke O'Death is now available for all in new-gen GTA Online. 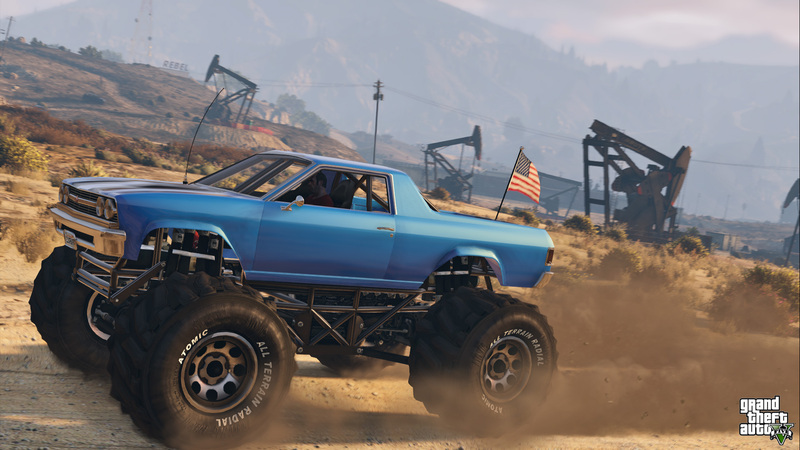 Land Grab Adversary Mode is a new take on Capture-the-Flag. The Turismo Classic joins GTA Online. Resurrection Adversary Mode is released along with the Infernus Classic. The Hijak Ruston is added and the Stunt Race Creator gets an update. After adding more stunt races and related items earlier in the month, Rockstar released Cunning Stunts: Special Vehicle Circuit featuring new vehicles. Valentine's Day returns in GTA Online with the return of items from the previous year. Collection Time is the next new Adversary Mode released plus the Dewbauchee Specter makes its debut. 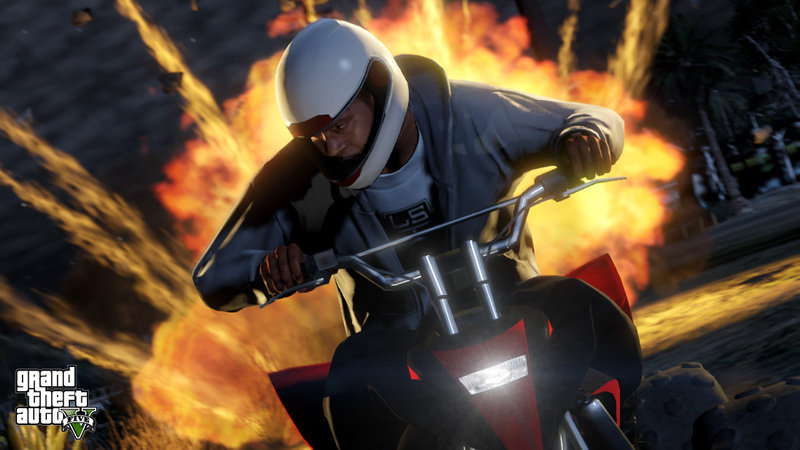 A new Adversary Mode titled Vehicle Vendetta is released along with the Pegassi FCR 1000. 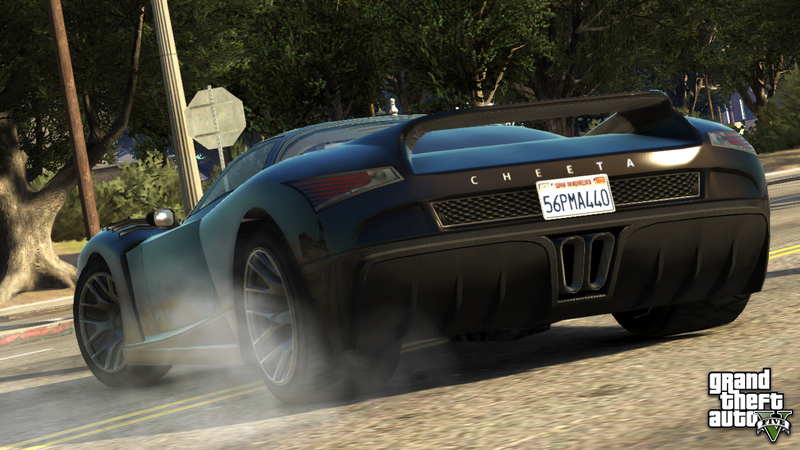 Later the Progen Itali GTB Custom becomes available. Festive Surprise returns to GTA Online featuring the return of holiday content and other special bonuses. 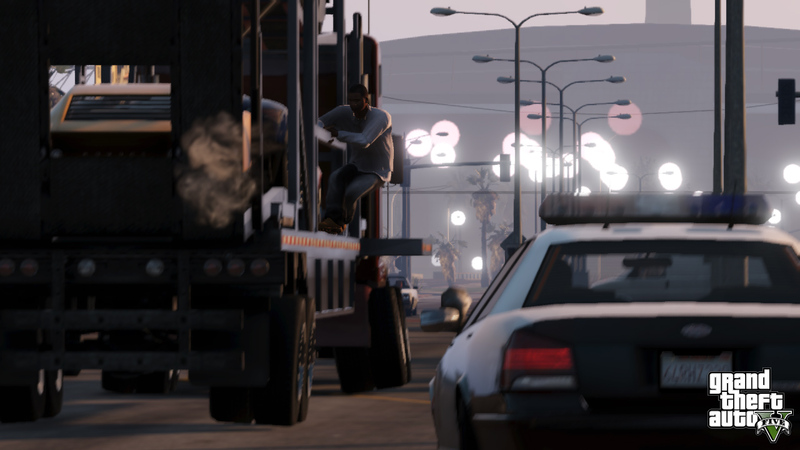 After additional vehicles being released for the Bikers DLC, a whole new DLC titled Import/Export is released featuring plenty of new vehicles, new garages with tons of space, and new ways to make money. 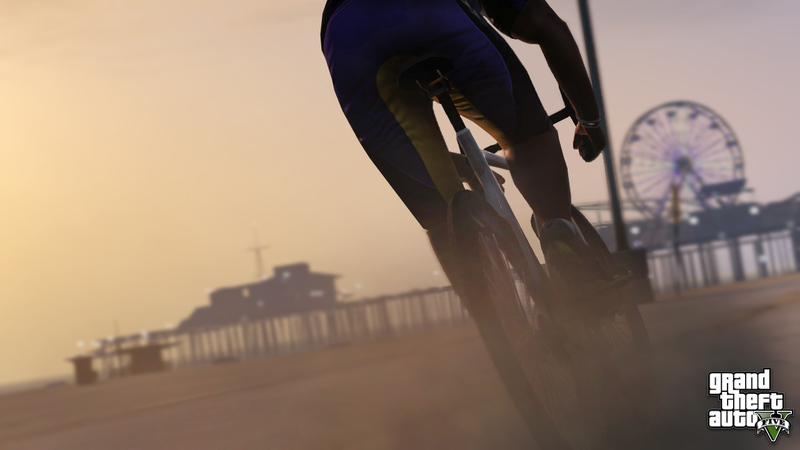 After two months of bonus weeks in GTAO, the long-awaited and requested Biker DLC is released. Similar to the VIP content you can form your own motorcycle club/gang and take on business ventures in Los Santos and Blaine County. The Content Creator for GTAO is updated to include stunt races and a new Adversary mode called Entourage is released. Five more stunt races and another set of three vehicles are added to GTA Online's Cunning Stunts DLC. Six additional stunt races and three more vehicles are added to GTA Online's Cunning Stunts DLC. Rockstar pleases the stunting and racing community with the Cunning Stunts DLC featuring more vehicles and plenty of sky-high fun as you race around above San Andreas. Power Play is released which is yet another Adversary Mode that will take you back to what video games used to be. Rockstar also releases the first of three new super cars as part of the Further Adventures in Finance update. The other two were released one at a time later. Rockstar expands VIP criminal empires in GTA Online with Further Adventures in Finance and Felony. You can now buy an office and a warehouse for your illicit goods. Rockstar adds the new Inch by Inch Adversary Mode plus the Vapid Minivan becomes customizable at Benny's. The Tornado becomes available to customize at Benny's featuring the usual lowrider options that will make South LS gangs rage with jealousy. Adding to Benny's customer base is the Lowriders: Custom Classics DLC. You can now customize a Slamvan, Virgo, and make the previously released Faction into a donk ride. Two new weapons include the Compact Rifle and Double Barrel Shotgun. Rockstar adds a new Rhino Hunt Adversary Mode to new-gen GTA Online. It is a simple premise: a small army of "hunters" tries to take out a Rhino tank. The Be My Valentine DLC releases featuring items from the original Valentine Massacre permanently available plus new items including the Roosevelt Valor variant which has even more customization options. 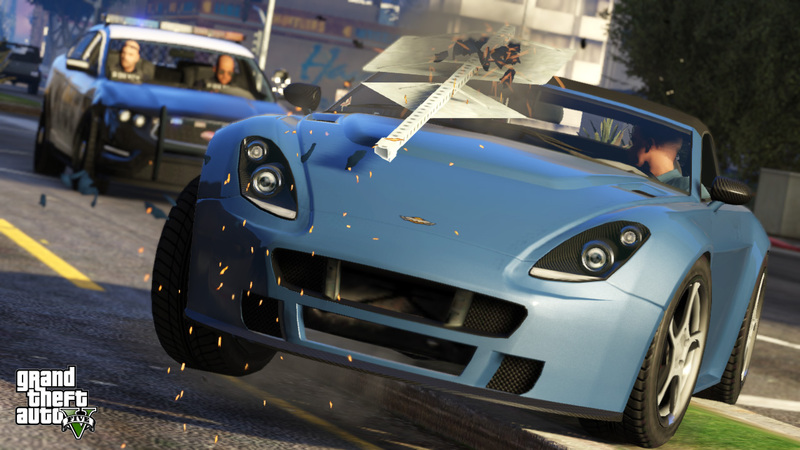 A small update to GTA Online for new-gen includes a new Drop Zone Adversary Mode and the ability to customize a Sultan or Banshee at Benny's to turn them into super fast race cars. Adding to the Festive Surprise, Rockstar brings back the snow, adds the new Beast vs Slasher adversary mode, and unleashes the Tampa back into the GTA realm. Once again Rockstar celebrates the holiday with Festive Surprise 2015. 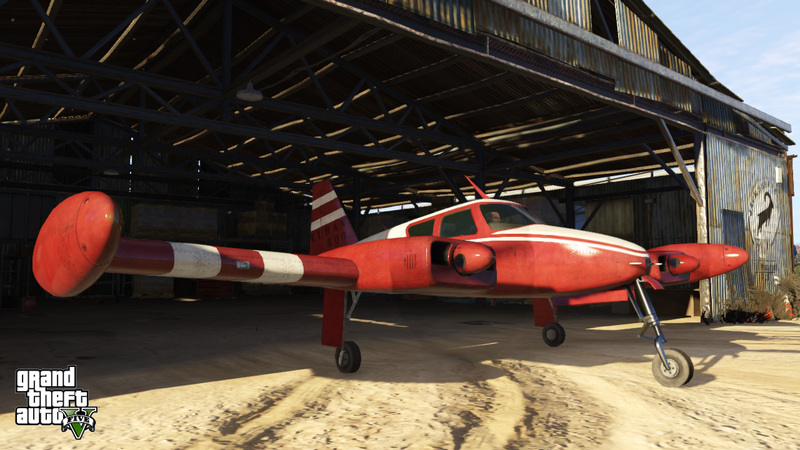 Christmas items in GTA Online return along with some new ones. After a month of small job updates and event weekends, Rockstar releases the Executives and Other Criminals DLC for new-gen GTA Online. 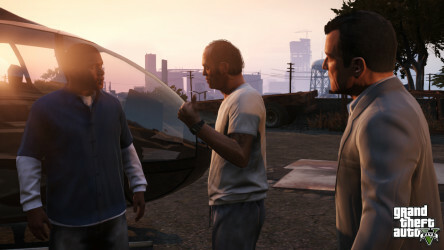 In addition to new armored vehicles, two new weapons, and new pads (including a yacht), players can now have or become bodyguards to another player with cash to burn. 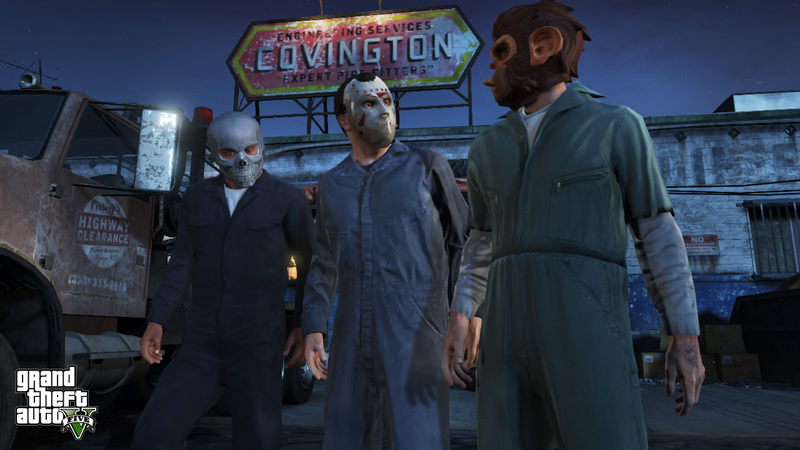 The Halloween Surprise is released for GTA Online. 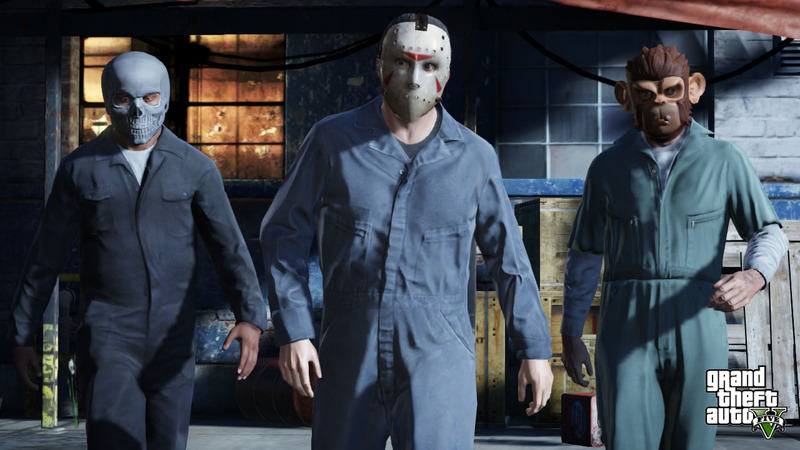 Two killer vehicles are added along with a flashlight weapon, new masks/face paints, and the new Slasher adversary mode. 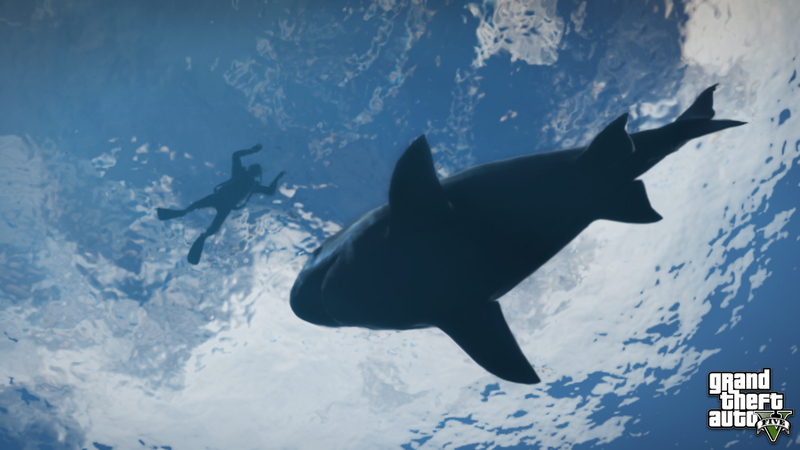 After a quiet month in August, Rockstar releases the Freemode Events Update for GTA Online which is a new, streamlined way to play jobs during free roam. 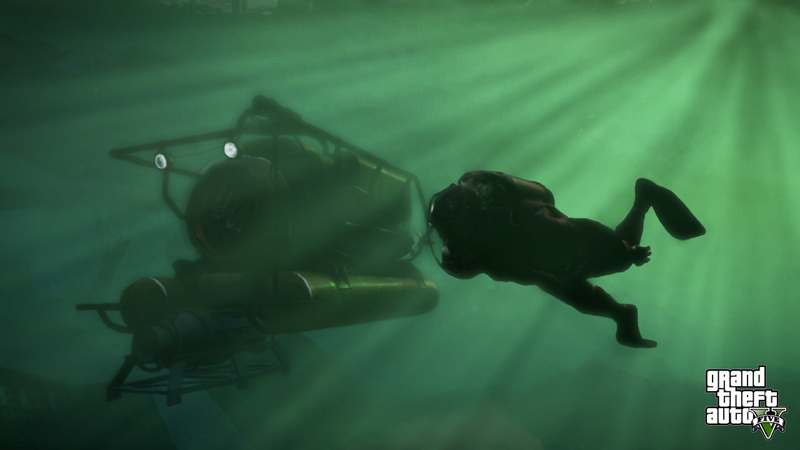 This DLC marks the first to be only for new-gen platforms. No further large updates to the old-gen will be made. 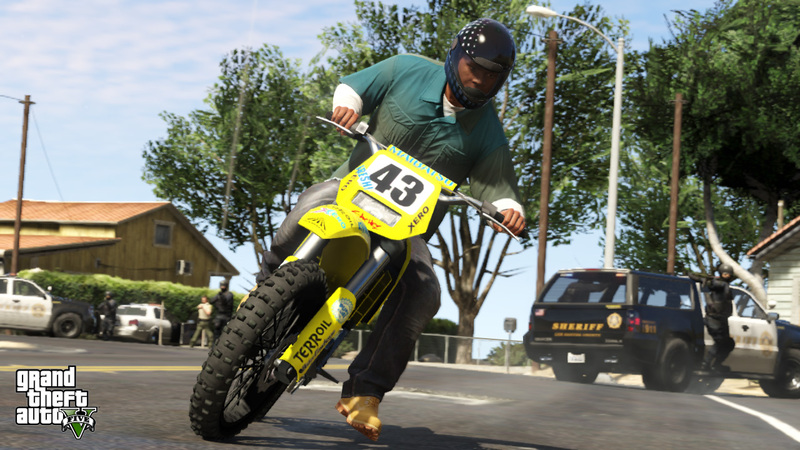 The Rockstar Editor also debuts on the PS4 and Xbox One consoles with the Freemode Events Update. Ill-Gotten Gains Part 2 releases with even more high-priced goods to spend your heist money on. "The Lab" radio station also makes its way onto all consoles. 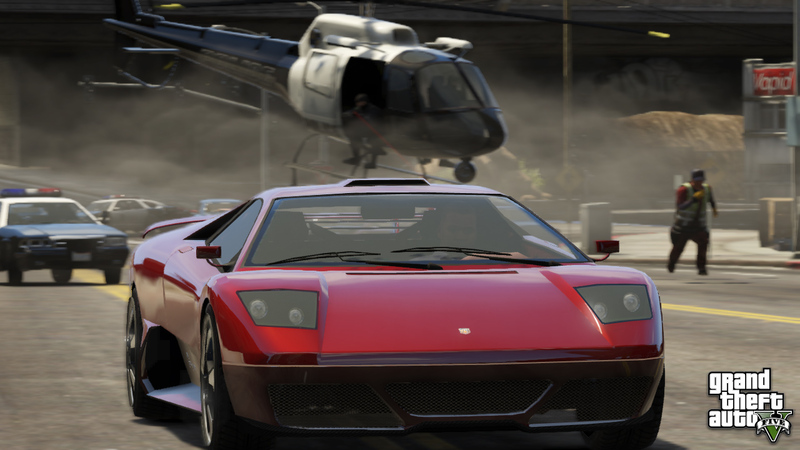 The DLC drought ends with the release of Ill-Gotten Gains Part 1 for GTA Online. The update features more gold than the Union Depository. And the items cost accordingly. The first PC video editor contest goes live. The challenge is to create a music video for "Leave" by Wavves. Don't have a monster gaming PC to play GTA V maxed out? 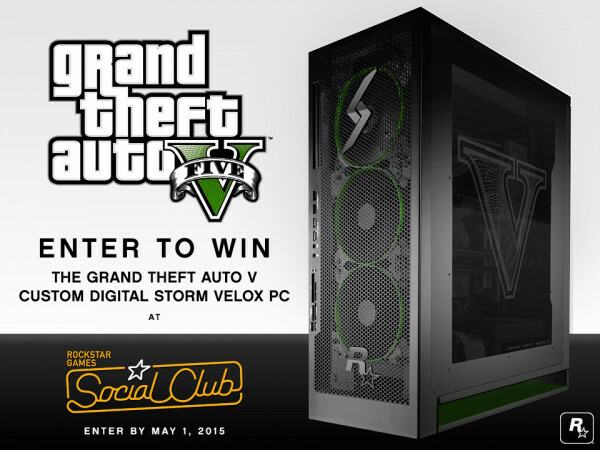 Rockstar Games is giving away a custom Digital Storm Velox PC. 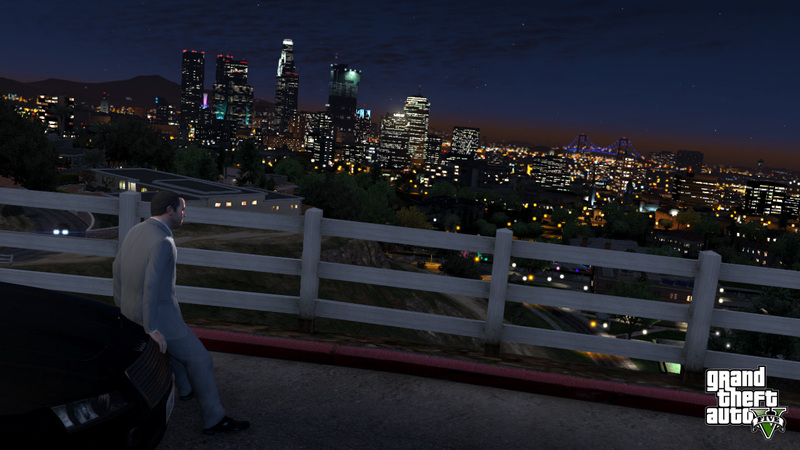 After a long, long wait Grand Theft Auto V finally makes it to PC. 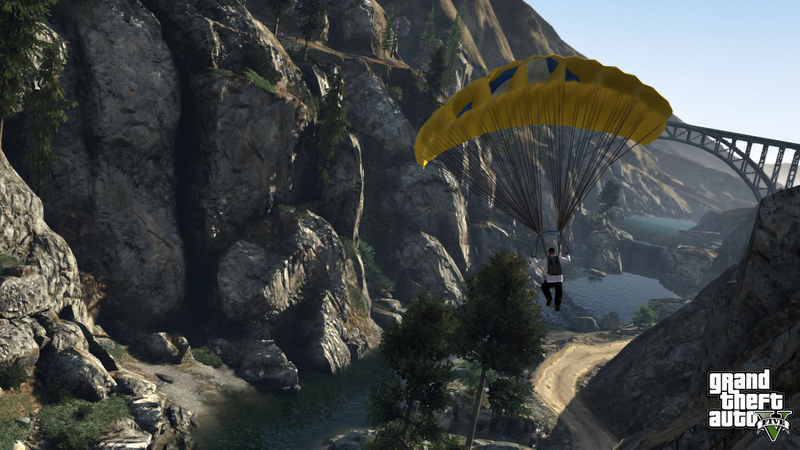 With the PC version launching soon, Rockstar gives an introduction to the updated video editor. 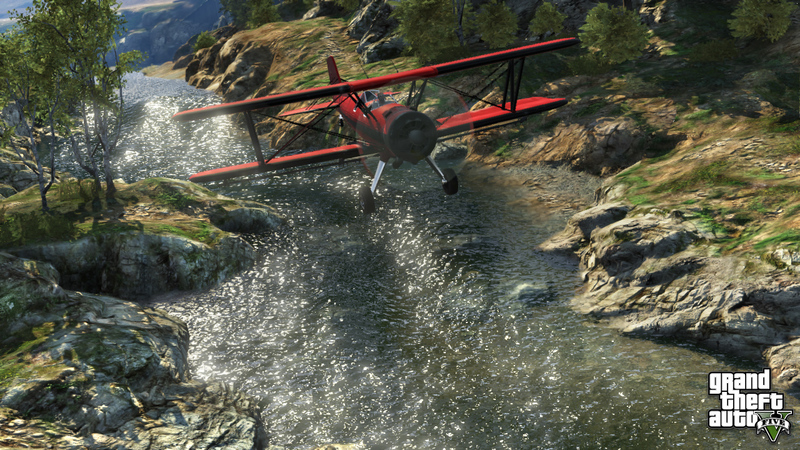 Hands-on previews of GTA V for PC are posted by gaming media. Things are looking up for the PC version. 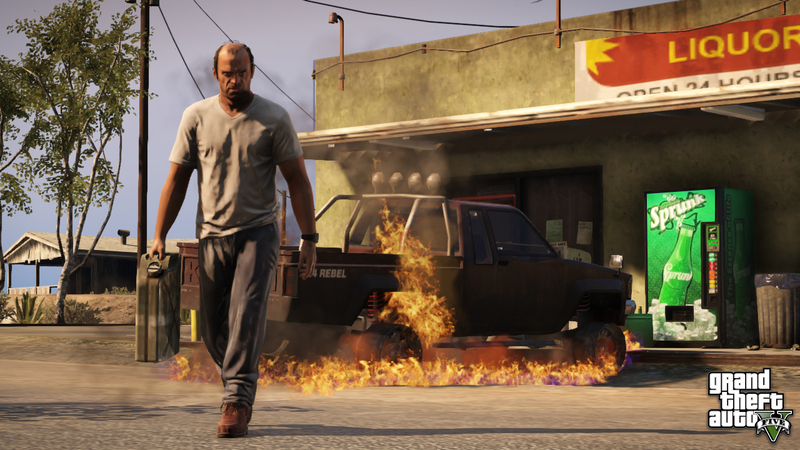 Rockstar releases a 60FPS trailer for GTA V on PC exclusively on their site. 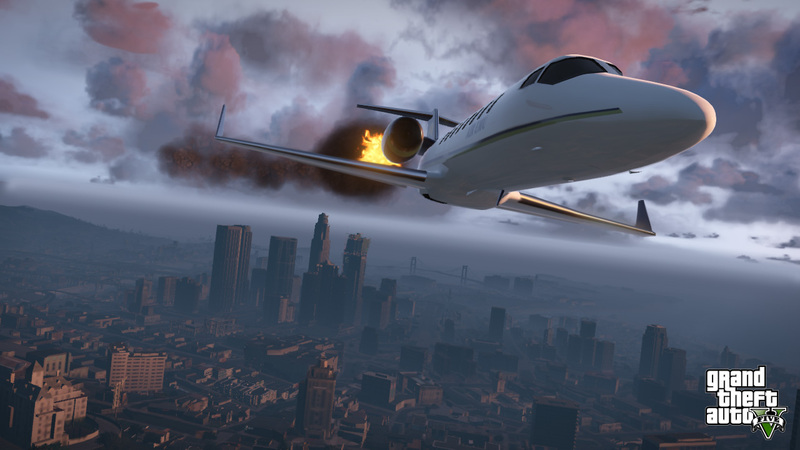 New screenshots are posted for GTA V on PC and a trailer is announced for the following week. 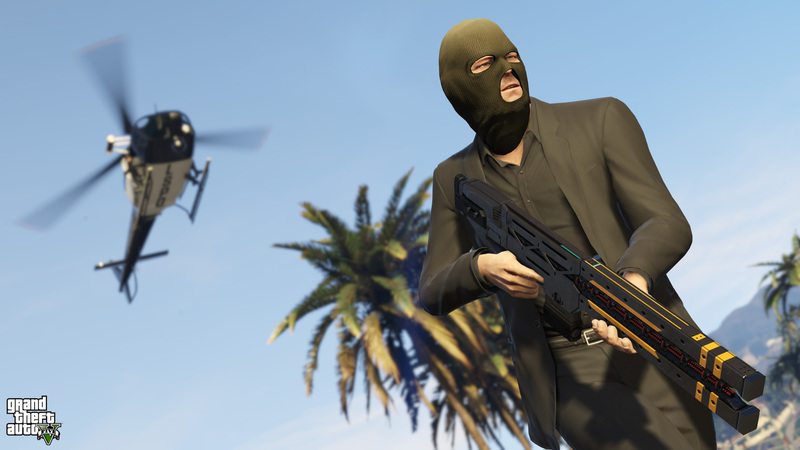 GTA Online Heists are finally made available! 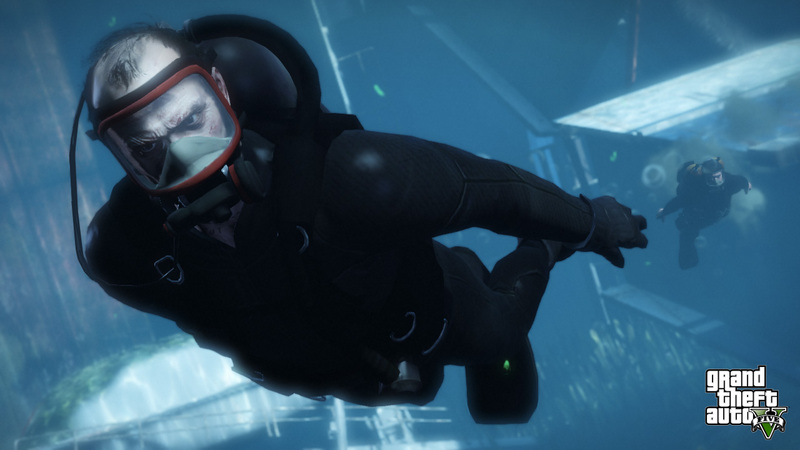 A third short heist video previews a bank robbery. 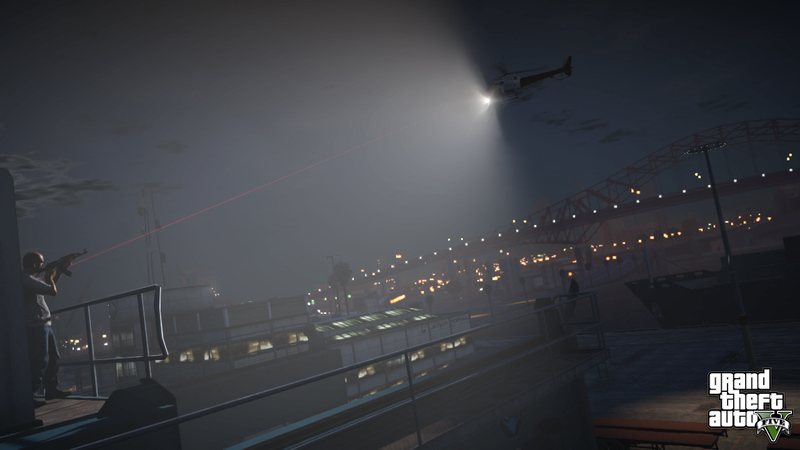 Another short heist video is released showing the Hydra being stolen from the Navy. This is on top of Rockstar announcing a new radio station called "The Lab" to debut with the PC version. 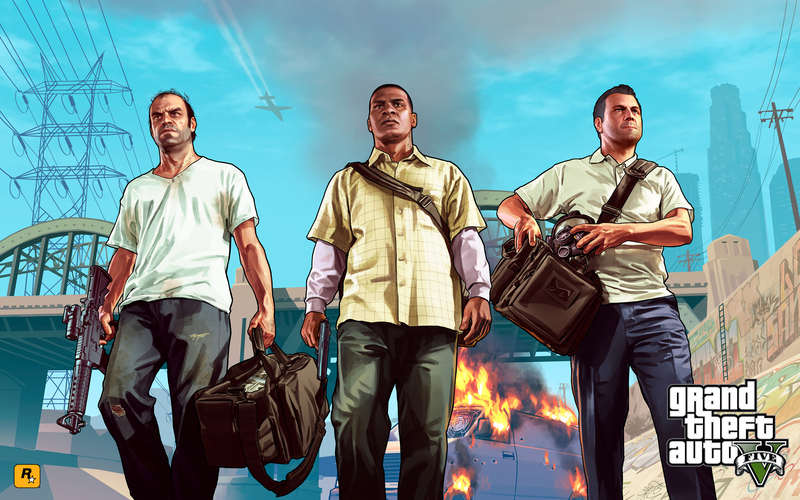 Later in the day Rockstar posts some tips on setting up your crew for heists. 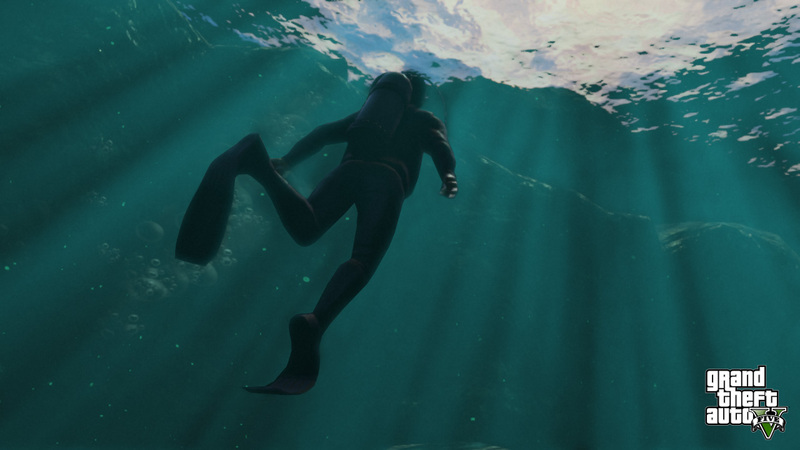 Rockstar releases 15 new screenshots for the PC version of GTA V.
Heists are officially set for a March 10th release but the PC version of GTA V is delayed another month to April 14th, 2015. 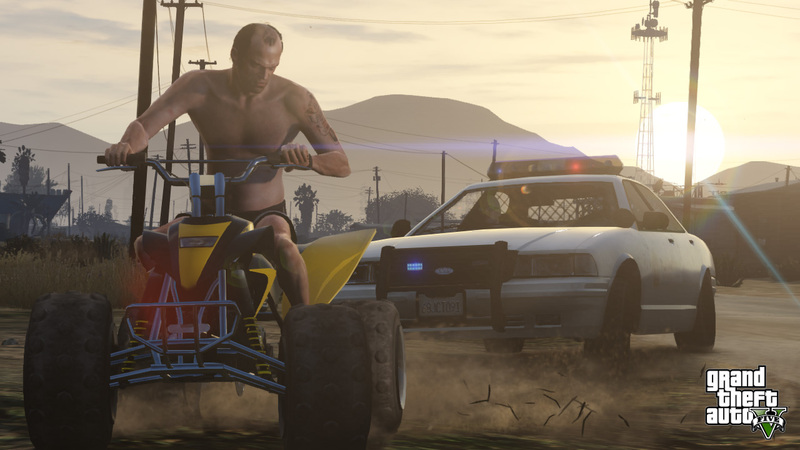 Just two weeks away from the PC release, Rockstar delays it to March 24th, 2015. On the upside heists are said to be coming before then for consoles. PC specs are also revealed. Rockstar wraps up the holidays with the Festive Surprise GTA Online event lasting from December into January. 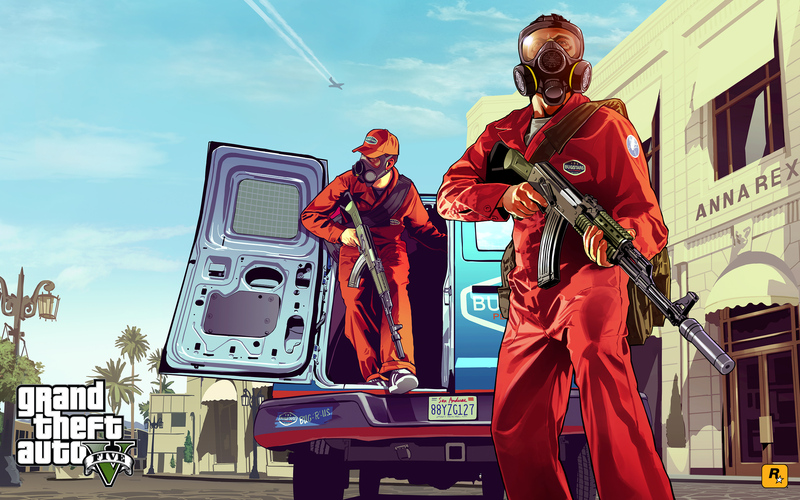 Rockstar finally shows us some updated GTA Online heist gameplay - plus they announce heists are coming early in 2015 - and IGN gets an interview for more information. Plenty of new screenshots are made available. Grand Theft Auto V enters the new-gen with its release on PlayStation 4 and Xbox One. Rockstar gives some additional information about the new-gen GTA Online including double the amount of props in the creator. 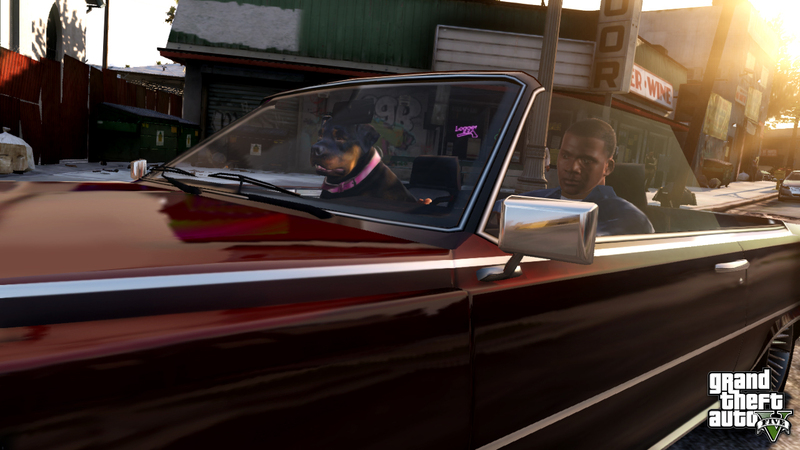 IGN gets the first preview of the new-gen version of Grand Theft Auto V. It is revealed that a first person view will be added and the closer view requires more than a simple graphics overhaul. Further previews talk about the increased pedestrian and animal populations plus a quick look at 30-player GTA Online matches. On the heels of the San Andreas anniversary, Rockstar celebrates Halloween with a weekend of bonus RP & GTA$ plus discounts on various items of interest and a Snapmatic contest. 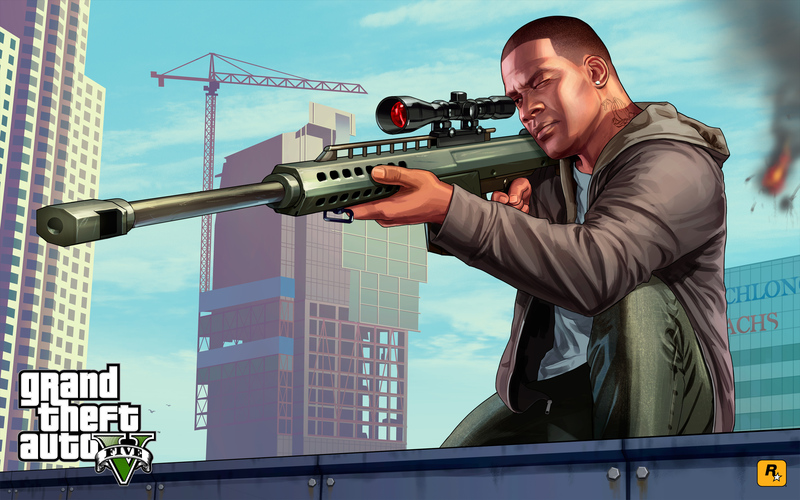 Details are revealed for exclusive content coming to the new-gen version of GTA V for returning players from the last-gen. New vehicles, side missions, and a Rail Gun are shown in screenshots. 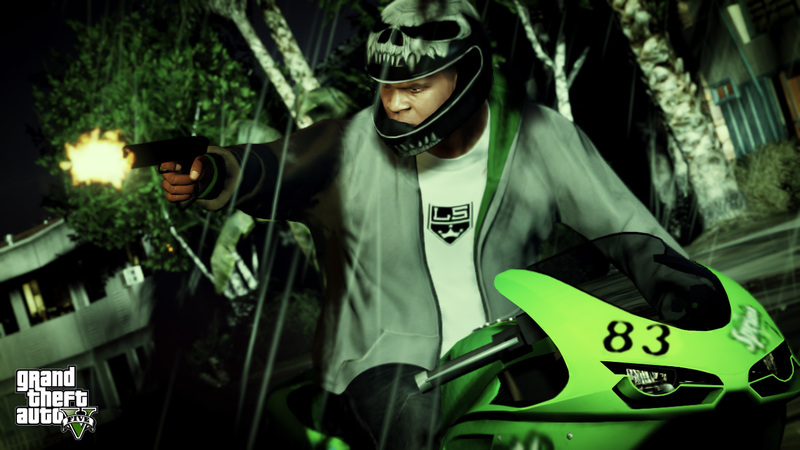 Rockstar celebrates the 10th Anniversary of GTA San Andreas with a special event weekend for GTA online featuring discounts on green apparel and a snapmatic contest. Another surprise DLC comes in the form of the Last Team Standing Update featuring new weapons, vehicles, clothing, jobs, and more! 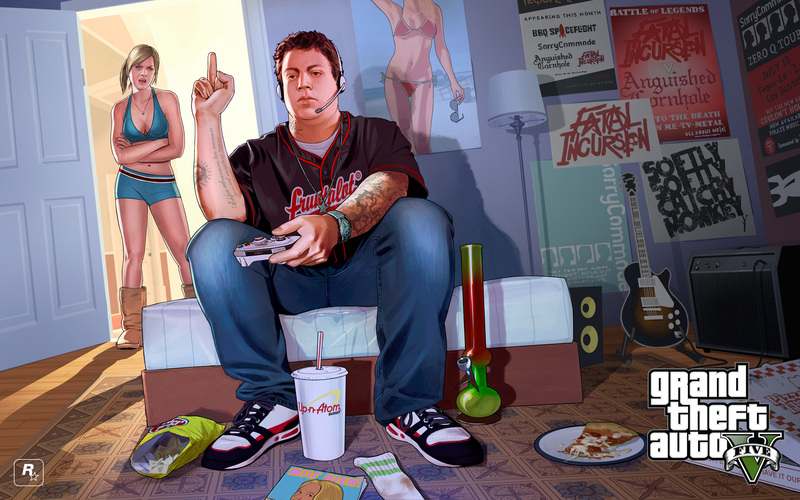 On GTA V's first anniversary Rockstar releases numerous GTA V and GTA Online artworks as wallpapers. 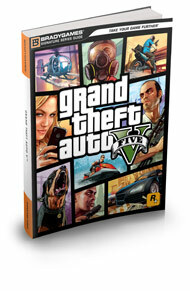 Rockstar confirms the release dates for the new-gen versions of Grand Theft Auto V. PlayStation 4 and Xbox One will get it on November 18th and PC users will need to wait until January 27th, 2015. 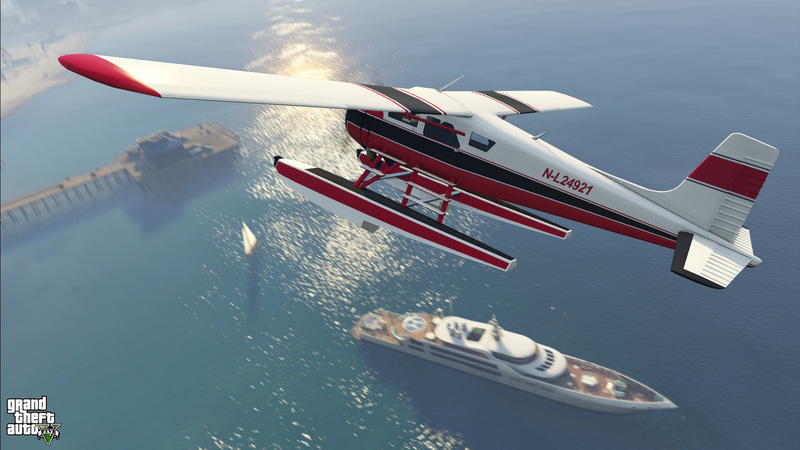 Rockstar takes to the skies with the San Andreas Flight School Update for GTA Online. The update features access to three new aircraft and the Coquette Classic plus new Air Force clothing and jobs too. Ammu-Nation sponsors the Independence Day Special which runs through half of July. 'merica!!! 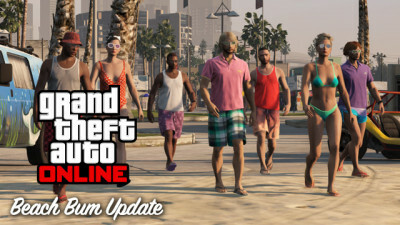 Rockstar goes against mainstream corporate strategy and releases the unannounced "I'm Not a Hipster" Update. During Sony's E3 event, Grand Theft Auto V was officially announced for PC, PlayStation 4, and Xbox One with a Fall 2014 release. 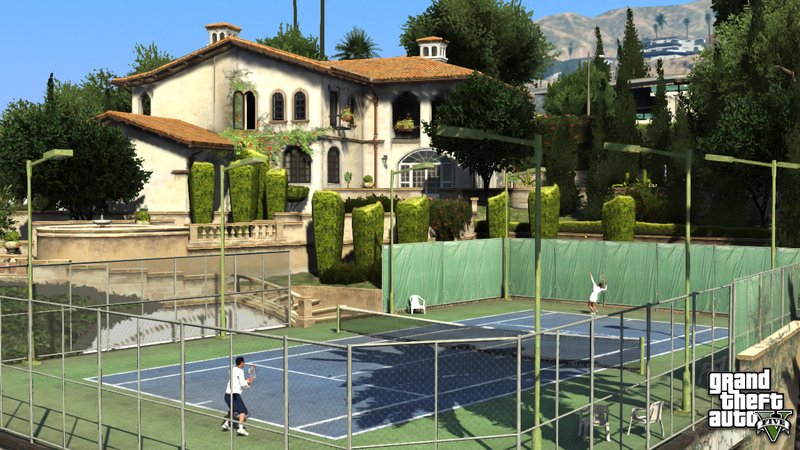 The High Life Update is released providing high-end apartments and new jobs for GTA Online. Plus new vehicles, the Bullpup Rifle, and other items. Adding to the Creator tools, Capture jobs can now be created. Choose to make Contend, GTA, Hold, or Raid styles of Capture. The Business Update is released featuring new GTA Online jobs, a few high-end vehicles, two new weapons, and appropriate clothing. Rockstar releases the Valentine's Day Massacre Special content. 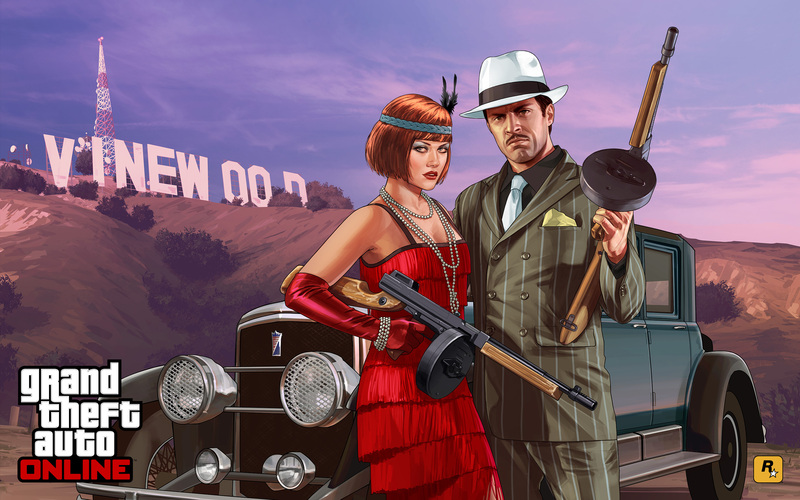 The 1920s gangster-themed pack features new GTA Online jobs, new outfits, Gusenberg Sweeper machine gun, and a classy Albany Roosevelt automobile. A Social Club update increases the member limit for Crews. You can now have up to 1000 people in a user-created Crew! Rockstar gets into the Christmas spirit with holiday themed clothing and even a snowday for GTA Online! An additional (free!) 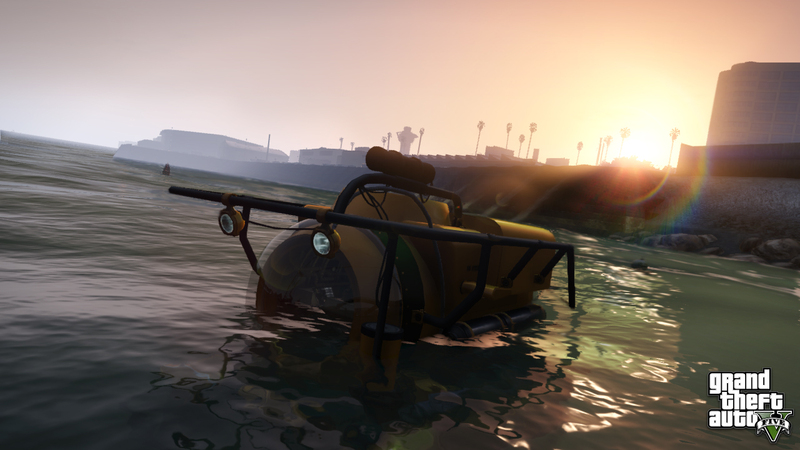 mode called "Capture" is made available in GTA Online. Capture is about more than flags. Wallpapers for Tracey and Simeon are released. The first (free!) 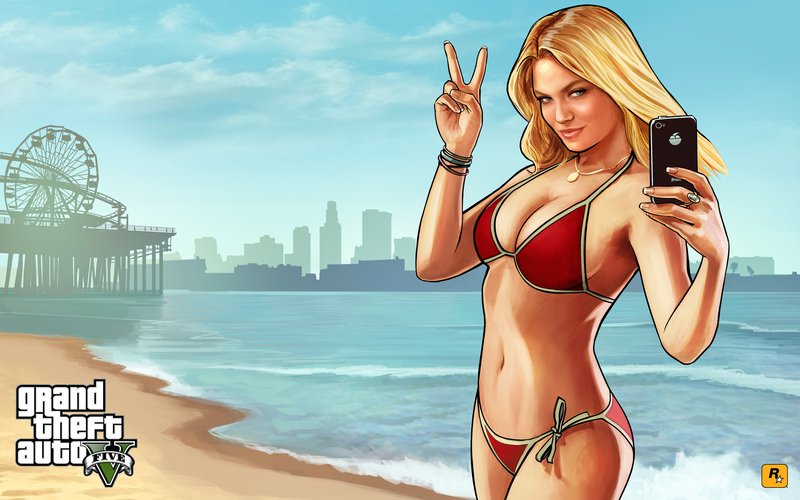 DLC for GTA V and GTA Online is released: The Beach Bum Update. 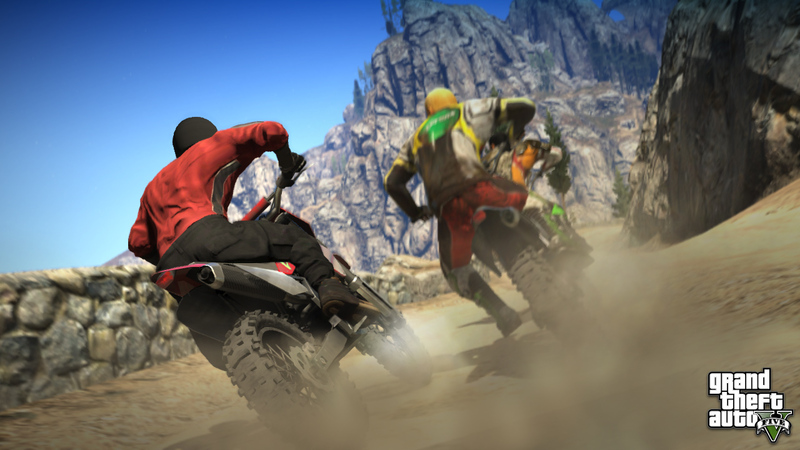 The update features new vehicles, weapons, and plenty of online action. 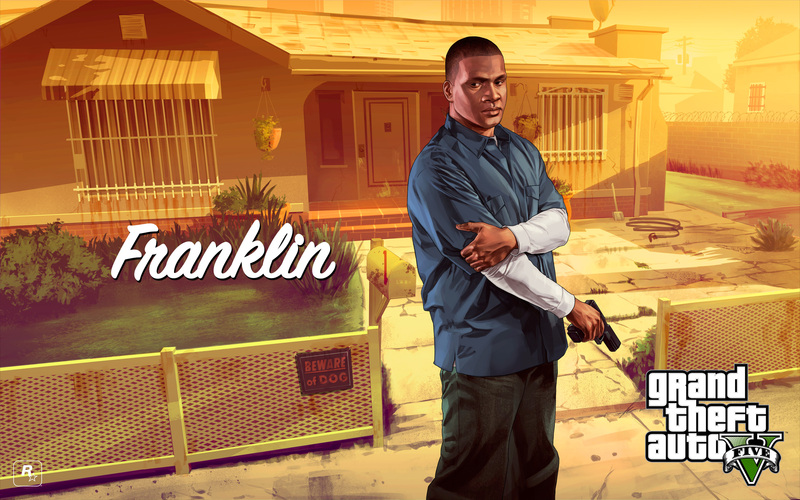 Official artworks of Franklin and Chop are released as wallpapers. Themes for the PlayStation 3 and Xbox 360 are made available. The iFruit App also comes to Android. 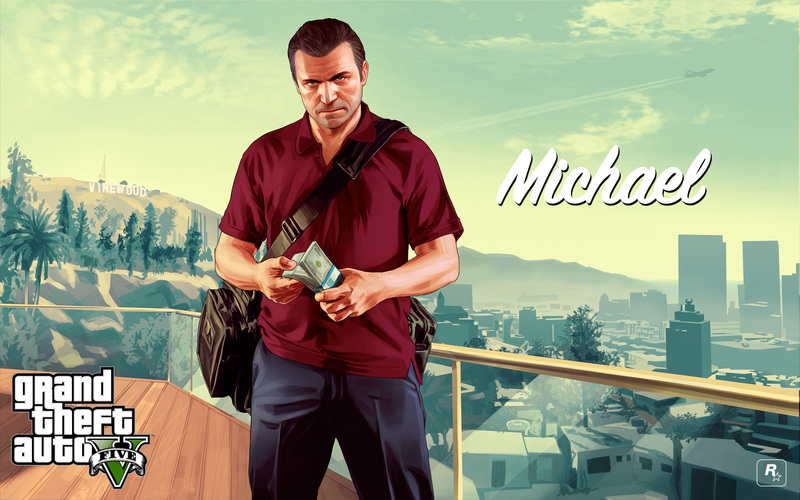 GTA V becomes available to download from the Xbox LIVE Marketplace. 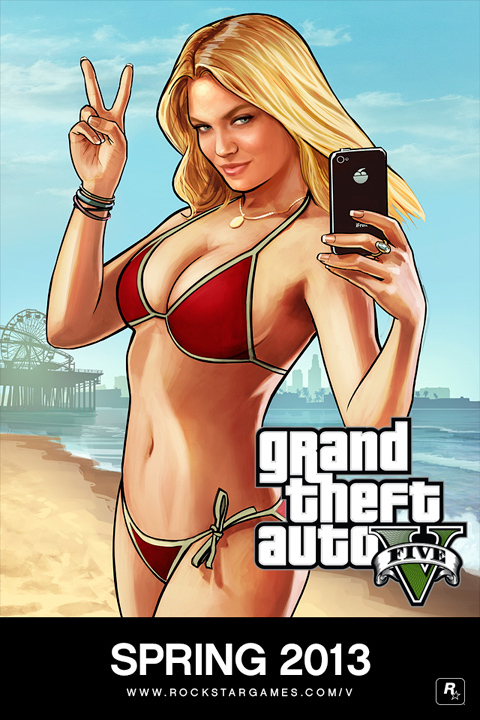 Grand Theft Auto Online is made available but to unfortunate circumstances as players experience many bugs while trying to get online. Rockstar releases free apps for iFruit and the full game manual. 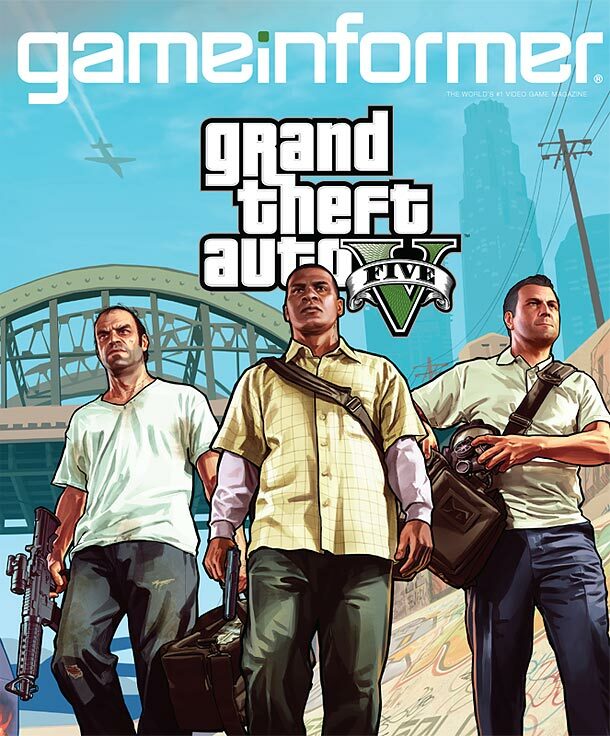 Later in the day reviews for GTA V are posted by various media outlets. 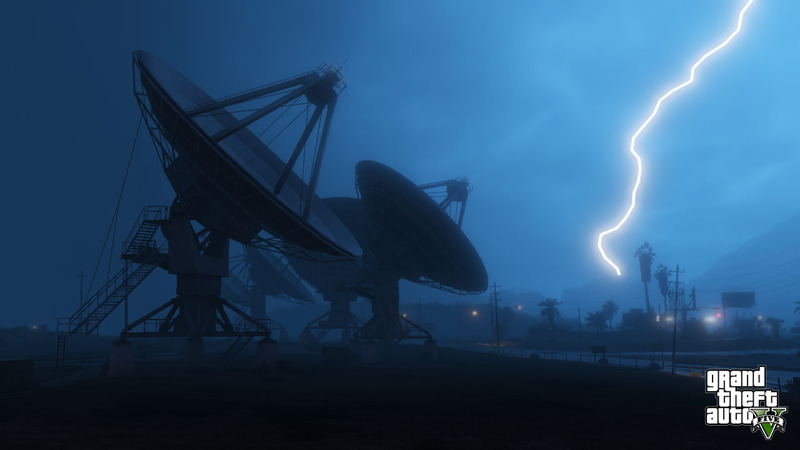 Rockstar posts a Midnight Release Locator for North America and the UK. 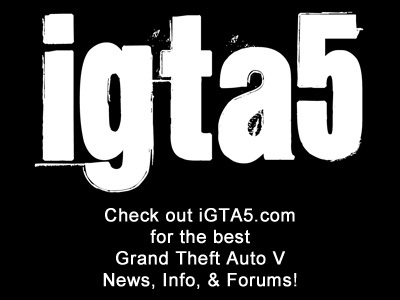 Later in the day the Official GTA V Website is updated and the final portions of the travelogue are made available. New screenshots and an artwork are also released. Rockstar launches LifeInvader.com - a fictional website crossed over into the real world. 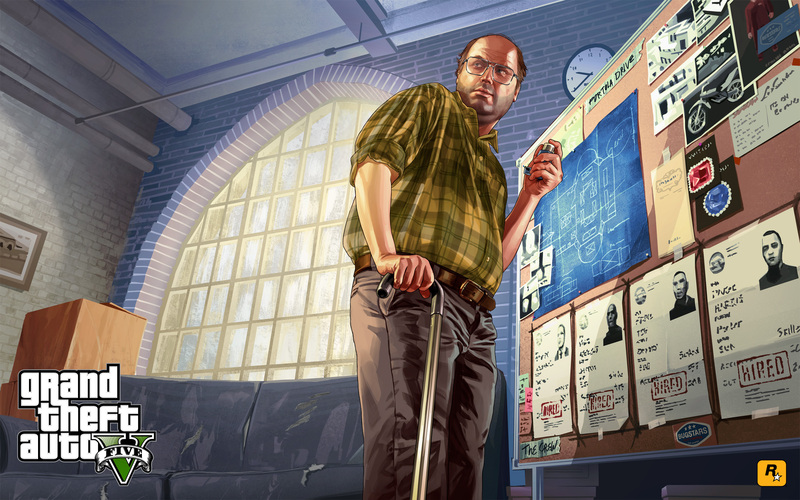 Businesses from GTA V offer discounts to their "stalkers" (via Social Club log in) that can be redeemed in the game. 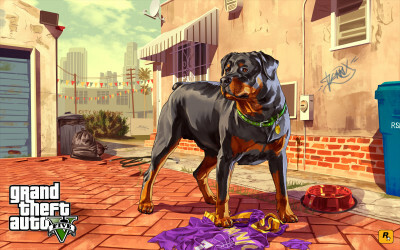 Along with an interview of Dan Houser, Polygon is given a new artwork of Chop to show us - a very large artwork too. 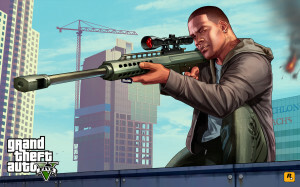 Game Informer posts their own GTA Online preview. 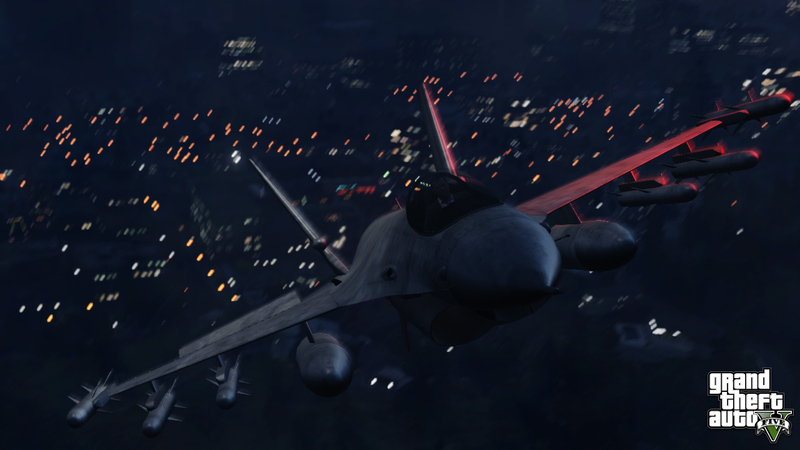 A little more detail is learned about GTA V's multiplayer aspect. 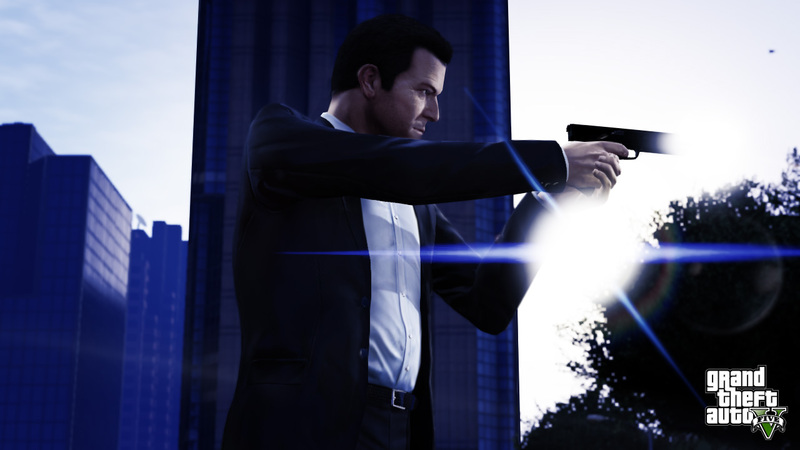 Each GTA fansite is given an exclusive screenshot to share with their visitors. A scavenger hunt ensues to find all of the new screenshots. 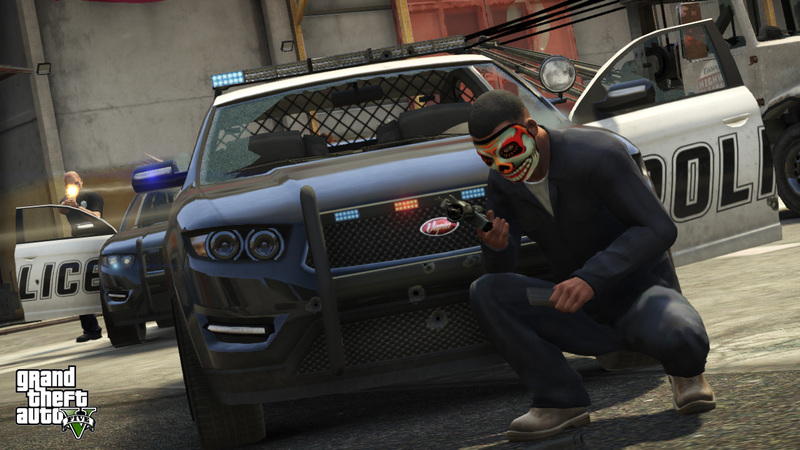 The official GTA V website is updated again with more information and screenshots. The official artwork for Lester is also released. With a unique announcement, the Epsilon Seminar winners are announced in a unique way as well through Cult Stoppers. 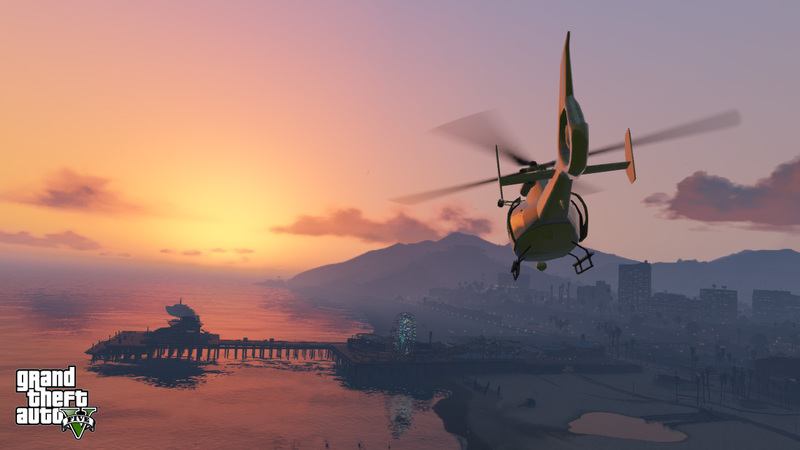 IGN posts the first hands-on preview of GTA Online. Needless to say we won't be disappointed. We hit the two weeks until release mark and the first hands-on previews are finally posted. New screenshots are also shown by very lucky media outlets. 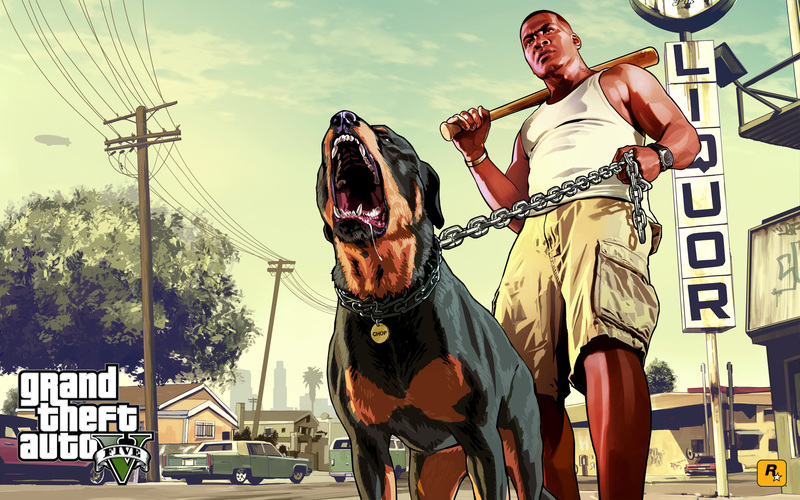 Rolling Stone and Pitchfork give out the first official details about GTA V's soundtrack and Rockstar fills in some other details including previews of radio stations. 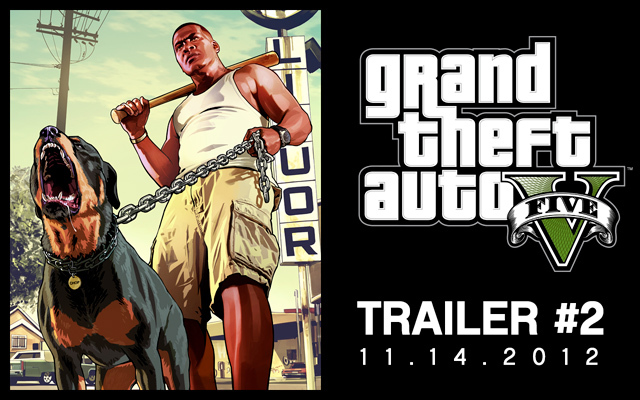 The fourth trailer is released simply titled "The Official Trailer" since GTA V had gone gold a few days earlier. 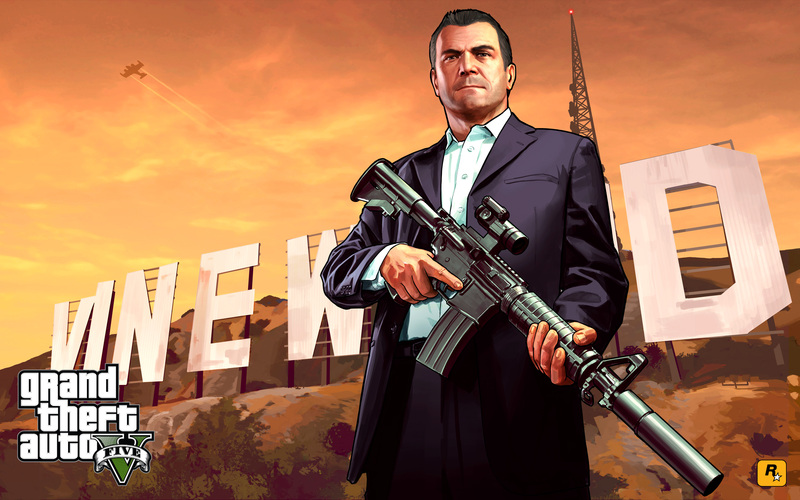 Grand Theft Auto V is announced to have "gone gold" by Rockstar Games via comments on their newswire. 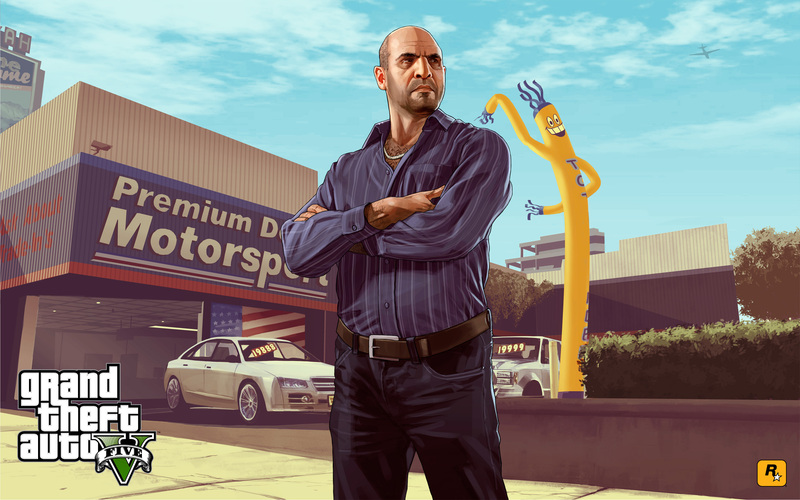 The official GTA V website is updated again with a few more content features unlocked. 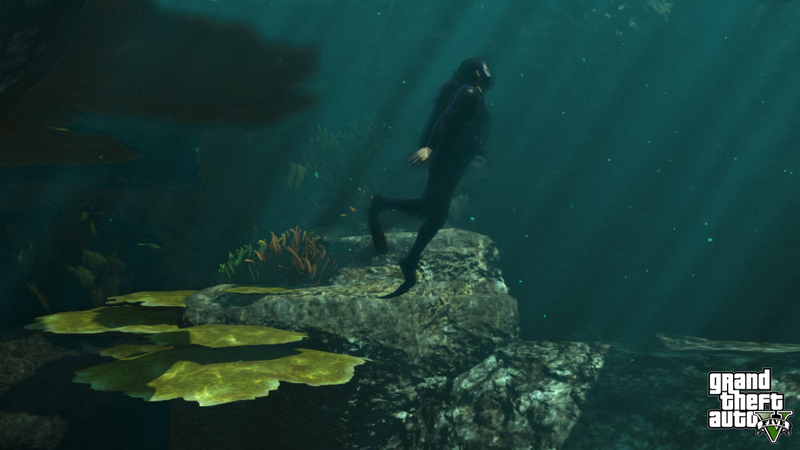 There are also 8 new official screenshots added to the gallery. 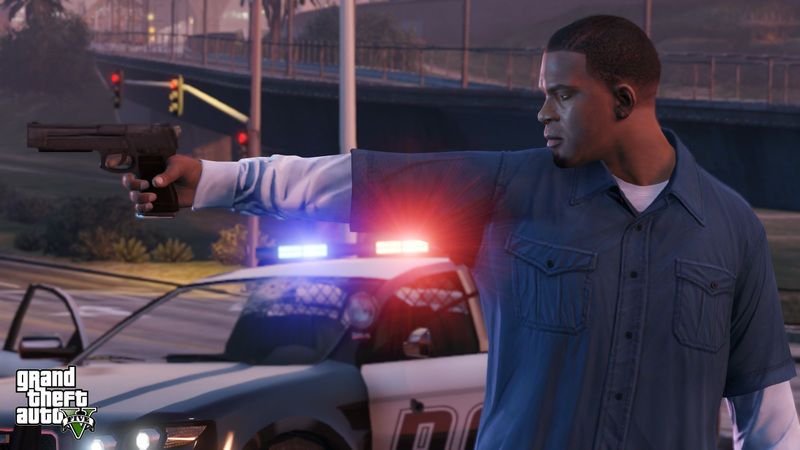 It is announced that GTA V will be available as a Day 1 Digital release on the PS3 - and a couple days later GTA V pre-load information from the European PSN is hacked into to reveal plenty of audio information. Whoopsies. 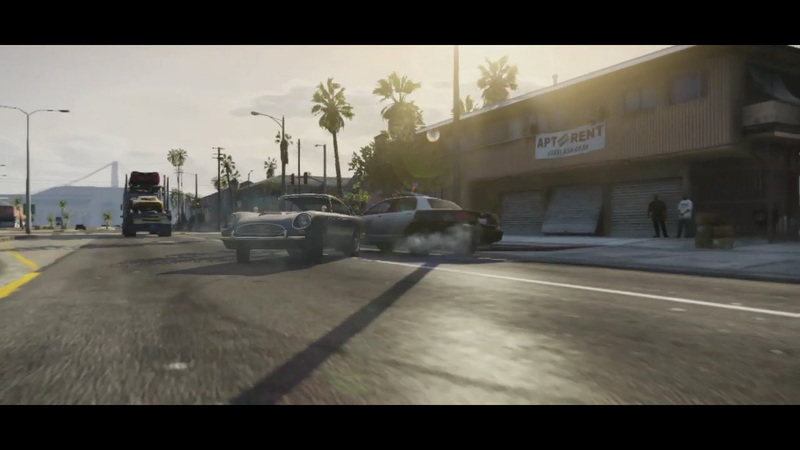 The Grand Theft Auto Online gameplay video is released. 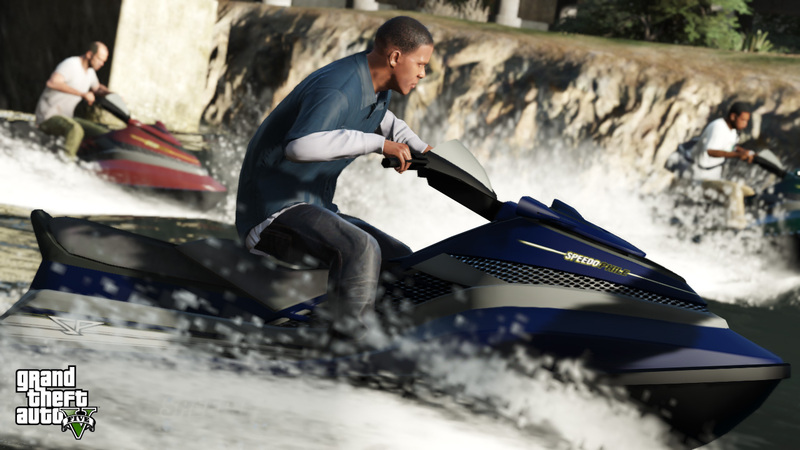 Minds are blown by the features GTAO will contain. Previews are also released by gaming media. The official GTA V website is updated - and essentially launched - with new screenshots and features about life in Los Santos & Blaine County. 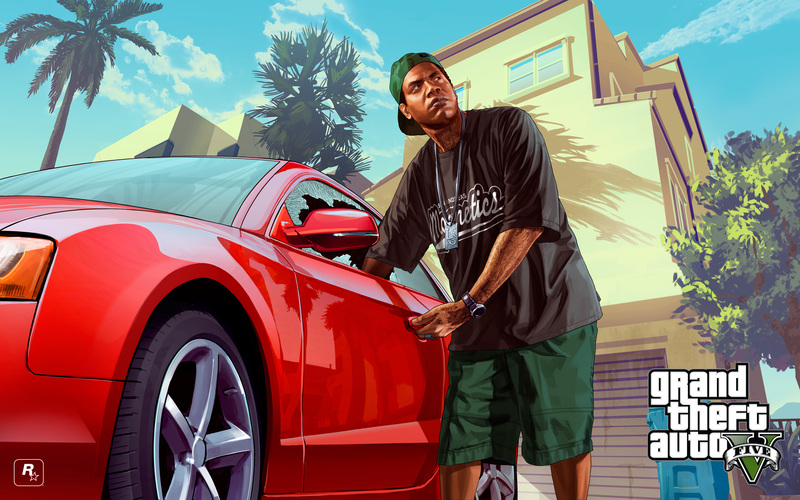 The American ESRB rates Grand Theft Auto V Mature which comes as a surprise to nobody. 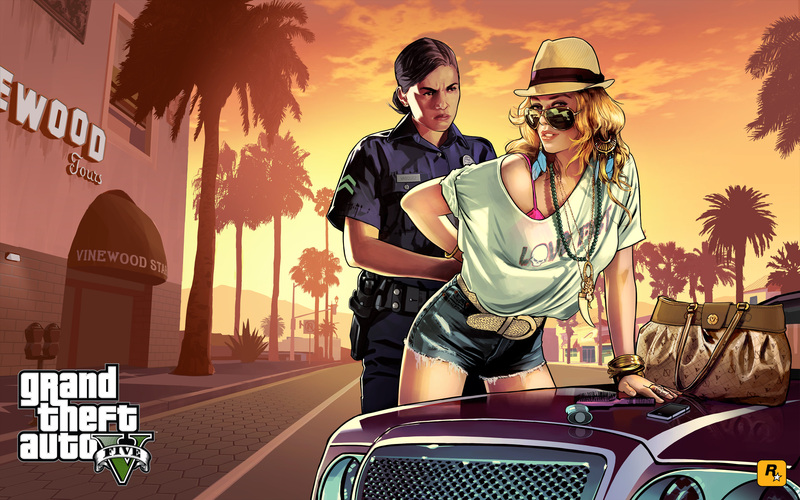 The Australian Classification Board also rates the unedited GTA V R18+. 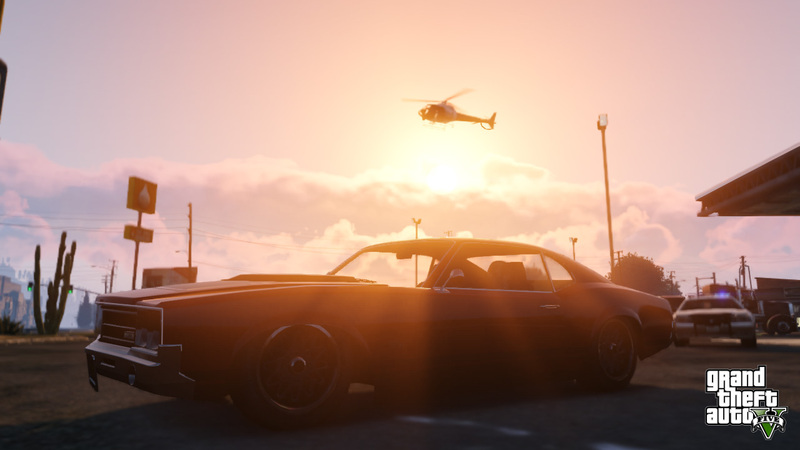 Rockstar releases 12 new screenshots under the title "The Fast Life". 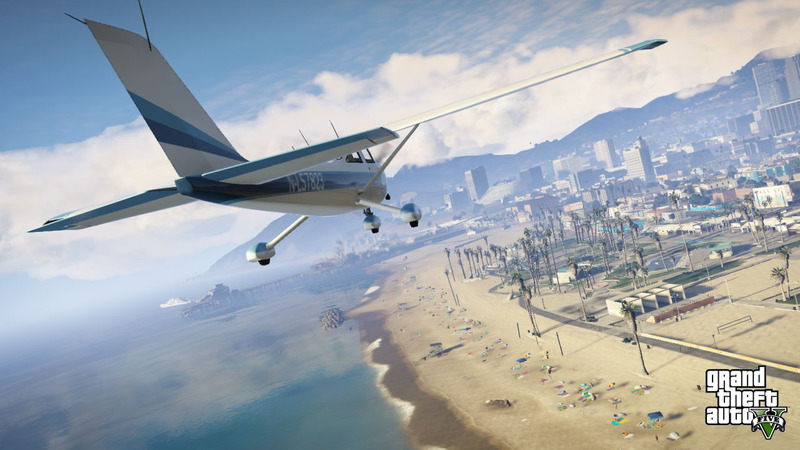 The first official GTA V Gameplay Trailer was released. We have 143 screencaps created from the trailer. 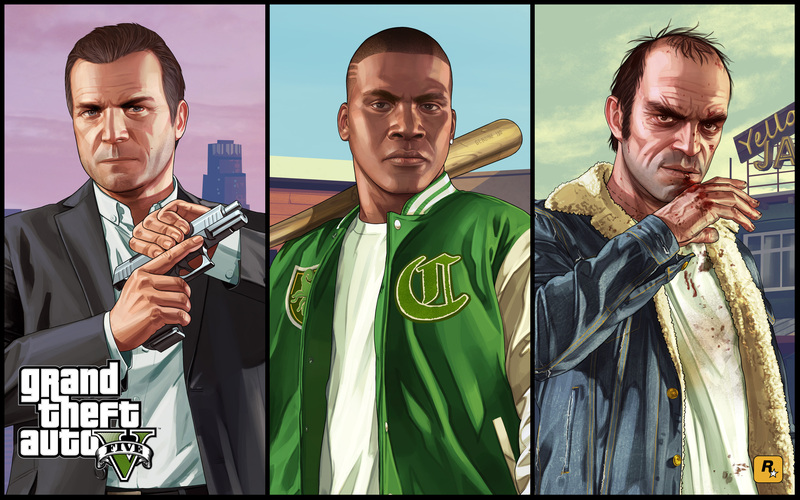 Soon afterward Game Informer released two new GTA V articles. 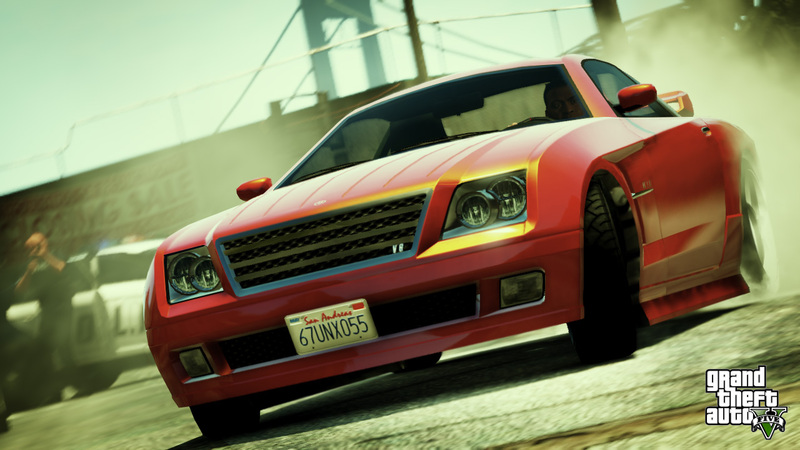 The first article is all about Customization, where discussions about guns and cars come into play. 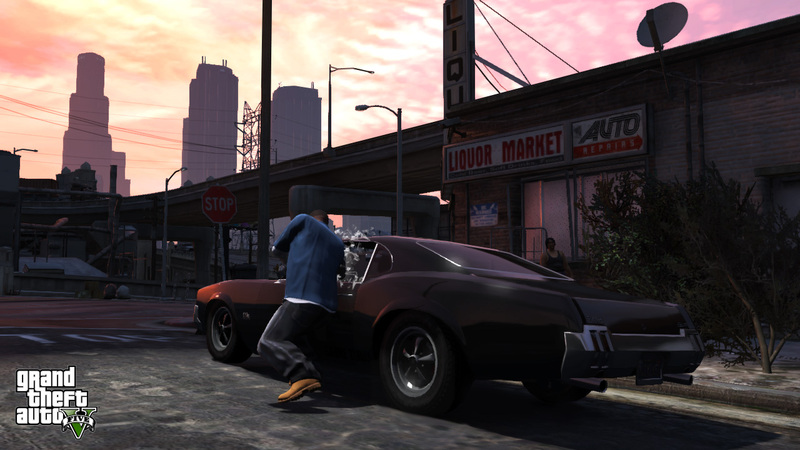 The second article was about Combat and Cover, and how they improved each by using ideas from past games to help evolve the combat from GTA IV. 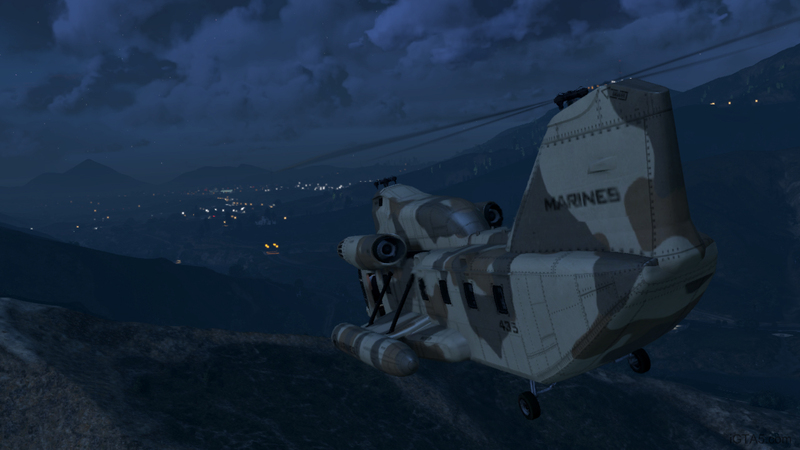 Media outlets also released 15 new screenshots. The 360 edition will use two disks, but fortunately the first disk will only be used for a mandatory install (8 GB) and won't be needed again unless to reinstall. The PS3 version only has one disk, and will also have an 8 GB mandatory install. They say that they will release the first Official Gameplay Video soon. As of right now they still have no info for us about a PC version, and are currently "completely focused on delivering the best possible experience for the consoles people have right now." 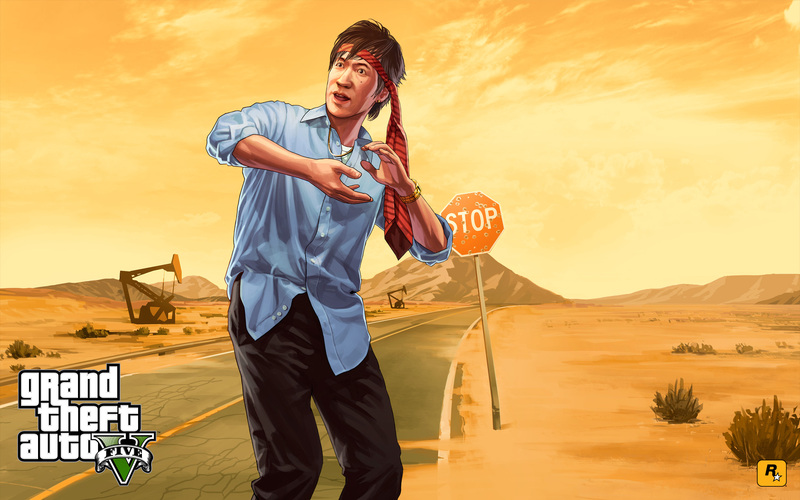 Rockstar then released two official wallpapers featuring Lamar and Jimmy which you may have seen previously from GTA V previews. 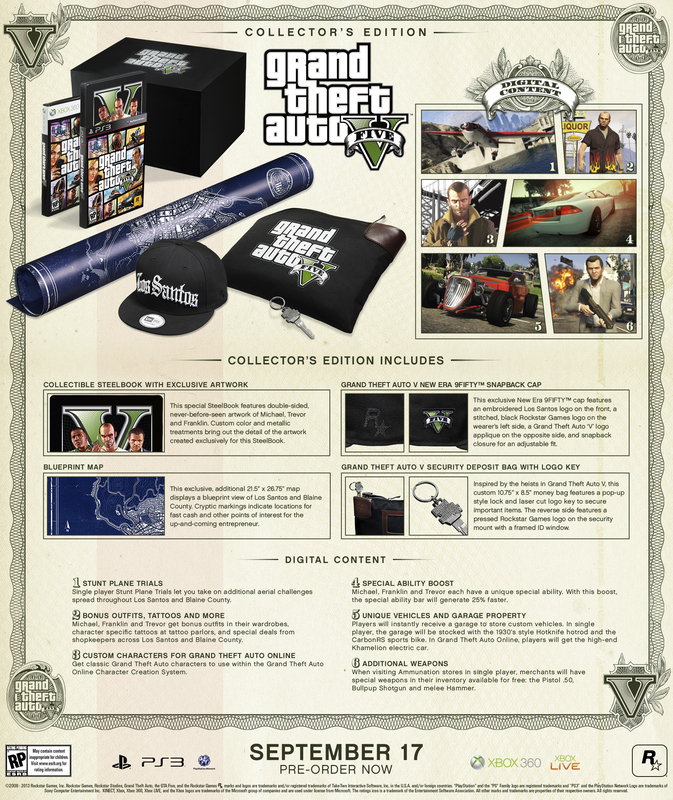 Brady Games has opened up pre-orders for the official Grand Theft Auto V Strategy Guide. 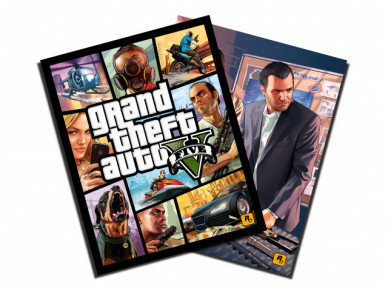 Also Gamestop announced that they will be giving away free posters for those who pre-order Grand Theft Auto V from them. 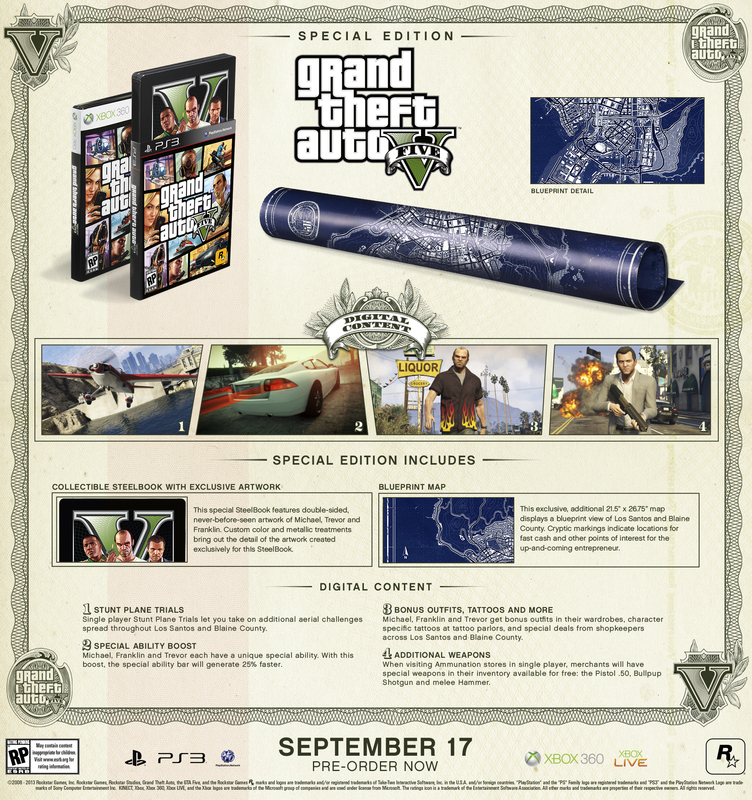 The poster features the cover art and heist planning artwork. 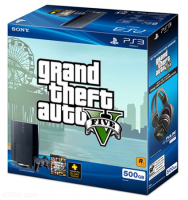 At this years E3 Sony announced they will be selling an exclusive GTA V bundle containing both the game and a Playstation 3 Slim. 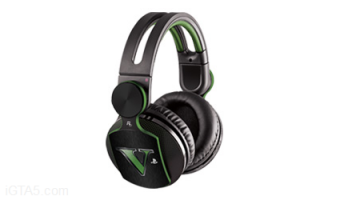 They will also be selling an exclusive $179 Grand Theft Auto V Pulse Elite Headset. 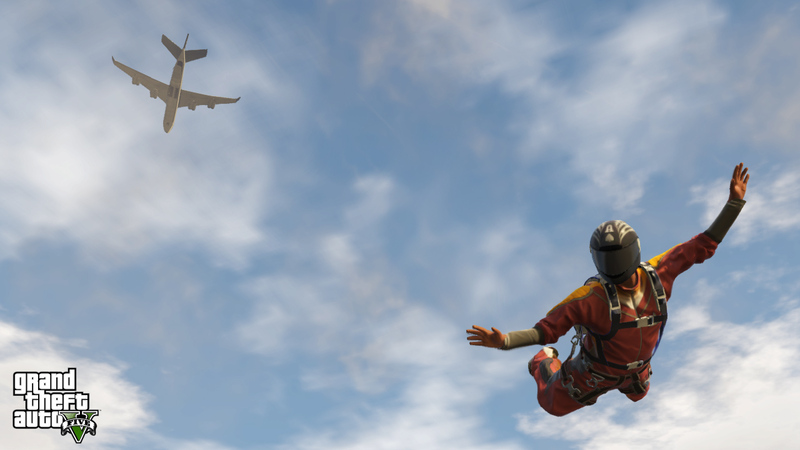 Rockstar then released the 9 screenshots seen at Sony's E3 press event. 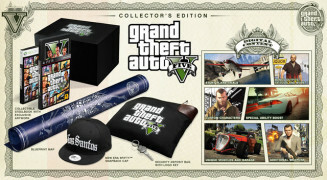 Rockstar announced the GTA V Special Edition and Collector's Edition are available for pre-order. Rockstar released one new screenshot, and three high quality versions of screens seen in past previews. The three new artworks that were used placeholders for the third trailers are released. Twelve additional screenshots are released. The second wave of previews hits the internet. 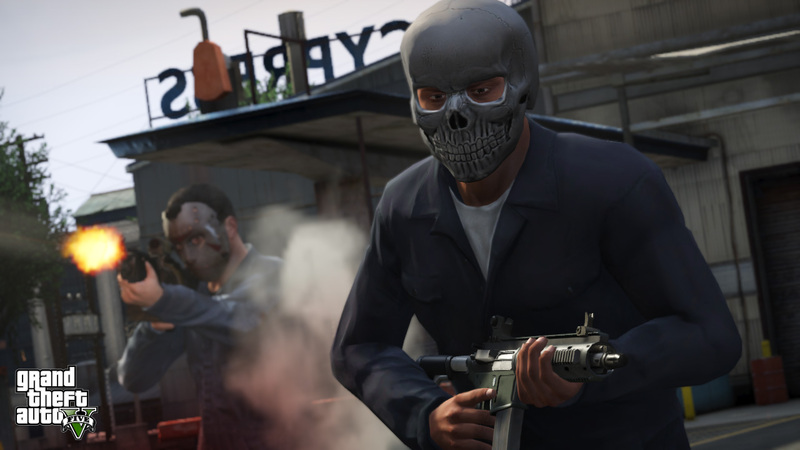 Much more is learned about gameplay and heists. Another 24 screenshots found in the previews are officially released the next day. Additional artworks were also shown in some previews. 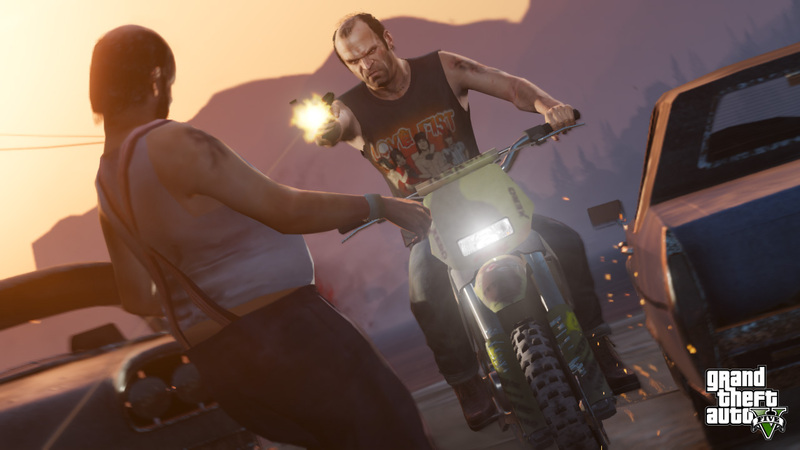 Rockstar releases a trio of trailers featuring each protagonist. All three are together in the video below. 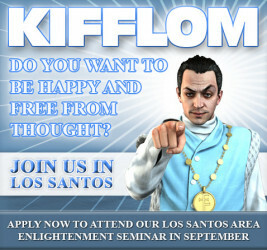 On the anniversary of GTA IV's release, a contest begins to put yourself in GTA V as an Epsilon member. 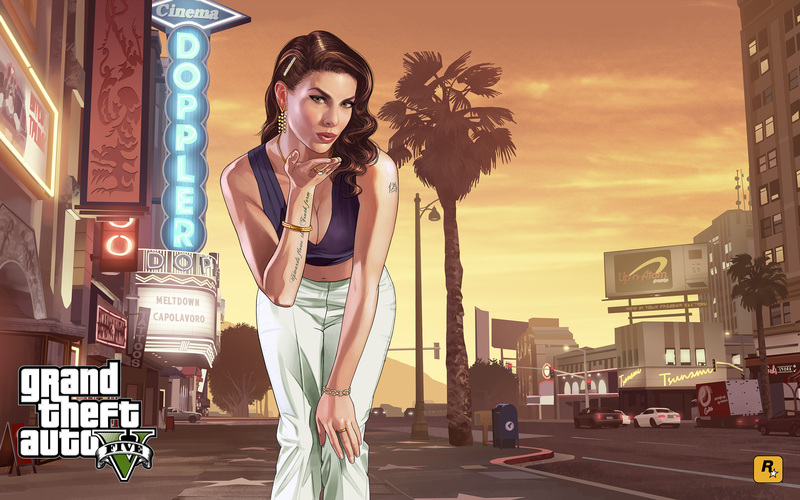 While watching a mural in NYC get painted, Rockstar releases the official cover art for GTA V.
After nearly two months of silence, Rockstar released 10 new screenshots. 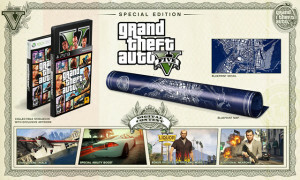 Rockstar announced the official release date would be September 17, 2013. 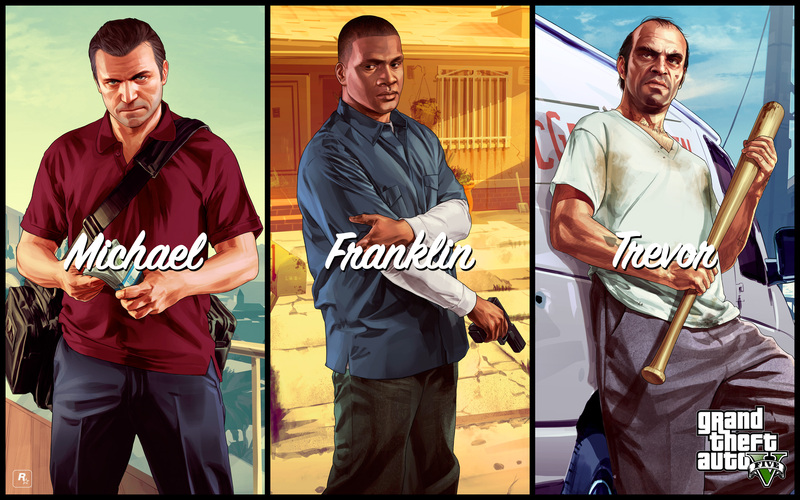 The day started with the release of 4 official artworks for download seen previously in promotional posters including Franklin & Chop and Michael in front of the Vinewood sign. 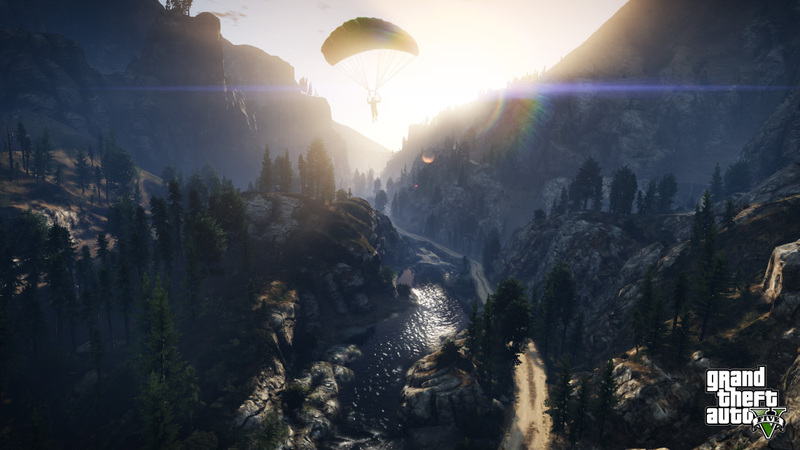 Rockstar released full versions of all previously released screenshots featured in previews. There were two additional ones never digitally released. 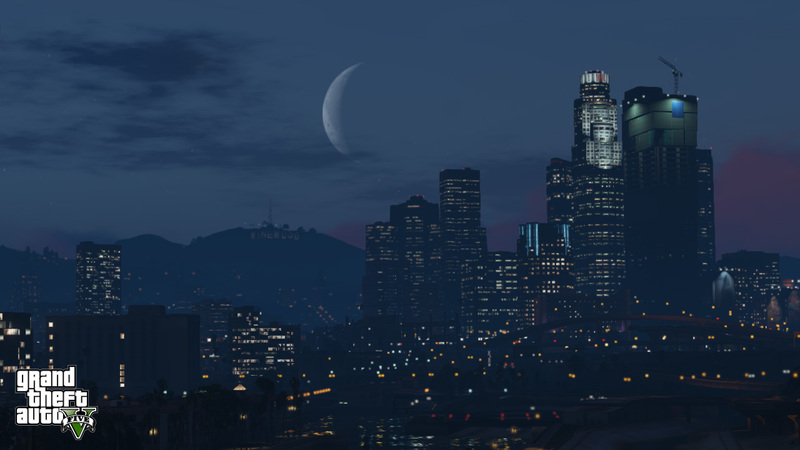 As a Christmas Eve present, Rockstar published 5 new screenshots. 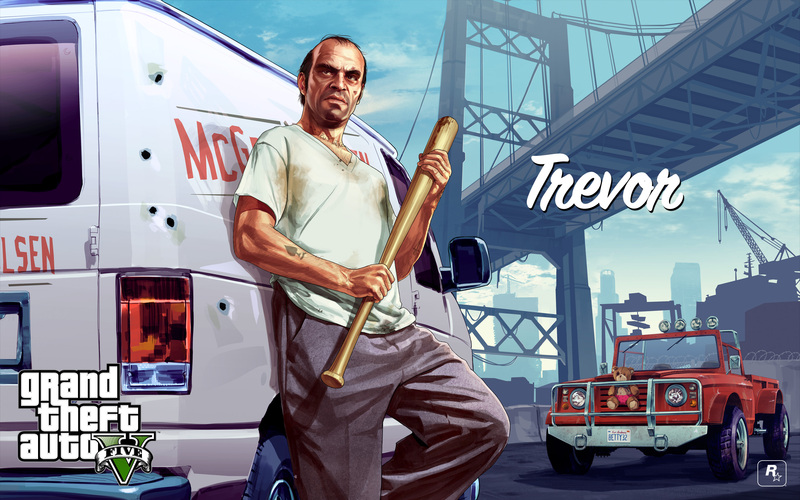 Rockstar Games releases the Trevor artwork for download. 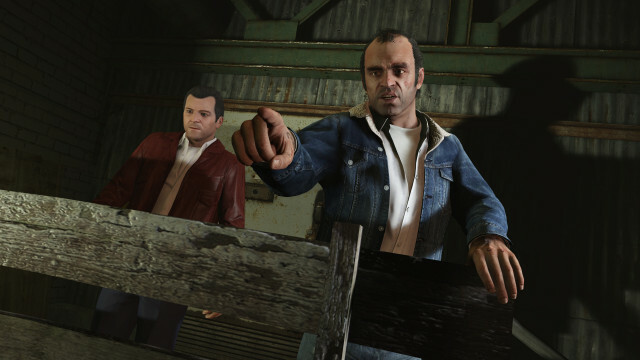 The second trailer for Grand Theft Auto V is released. Plenty of action in this one. 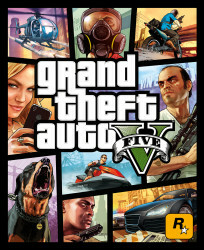 While a trailer countdown is added in place of the future trailer, Rockstar released the artwork used for Game Informer's cover for download. 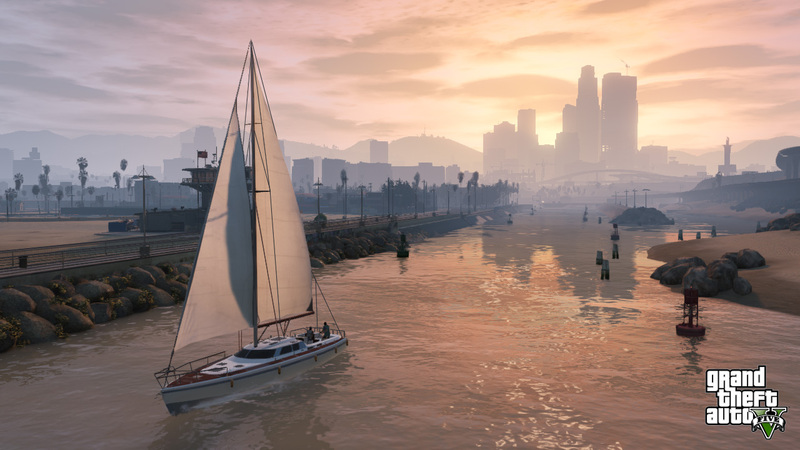 Game Informer releases the first preview of Grand Theft Auto V. A lot of information is spilled including what makes GTA V so special. Plenty of cool screenshots are shown too. 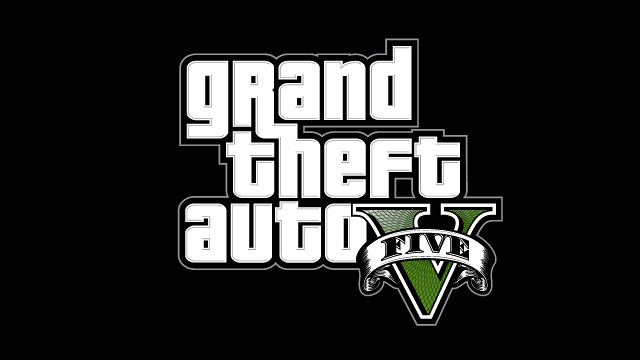 Rockstar announces the second trailer will be released on November 14th, and also starts allowing pre-orders of Grand Theft Auto V to begin. The 'Beach Weather' artwork was updated as well. Rockstar confirms Grand Theft Auto V will release in Spring 2013 among other minor information. A new artwork is shown as well, and other artworks from retail displays are posted on the internet. Two months after the screenshots Rockstar Games releases the first official artwork for GTA 5 titled "Pest Control". 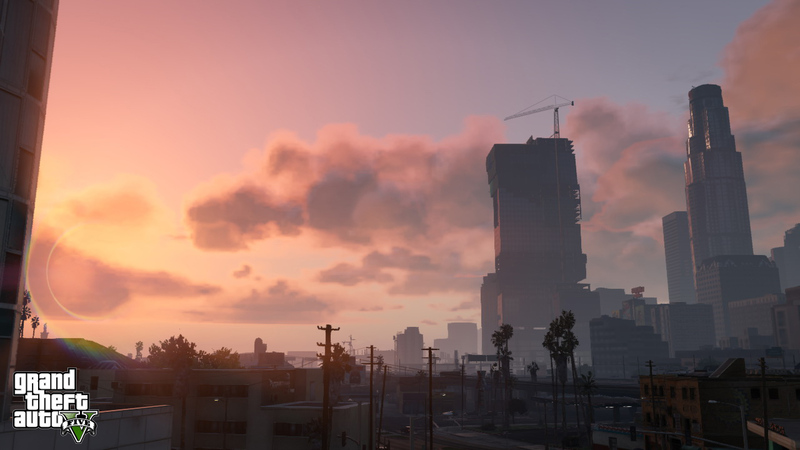 Rockstar released a final set of new screenshots for the week titled "Business". 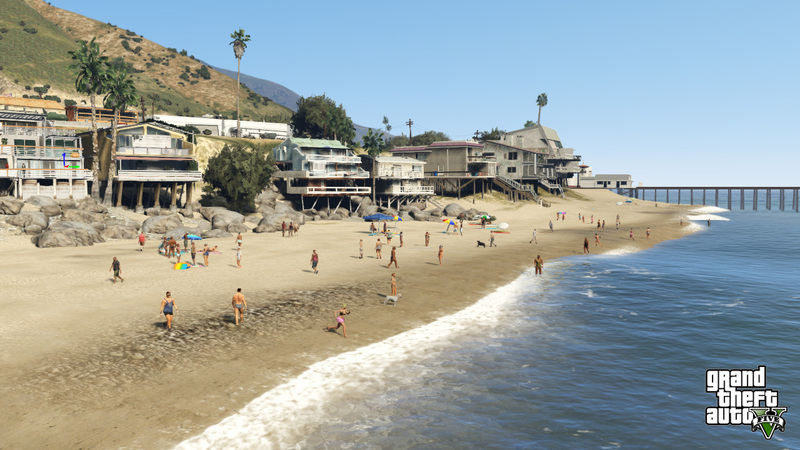 As promised, Rockstar Games released another three screenshots titled "Leisure". 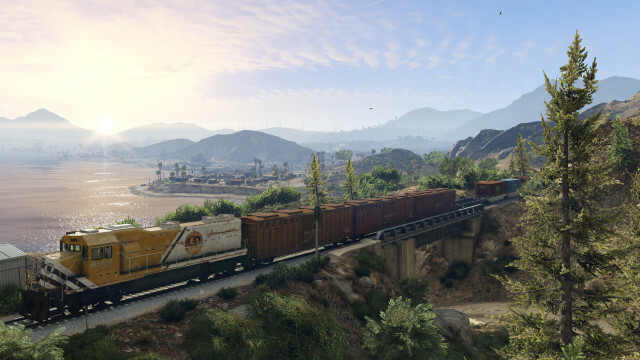 Rockstar Games released a further three screenshots titled "Transport" with the promise of more later in the week. 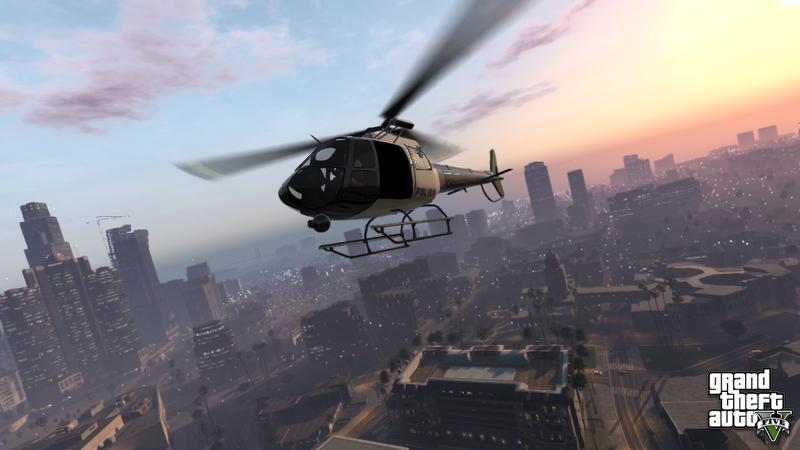 Rockstar Games released their first 2 official GTA 5 screenshots in a Questions and Answers session on their Newswire. 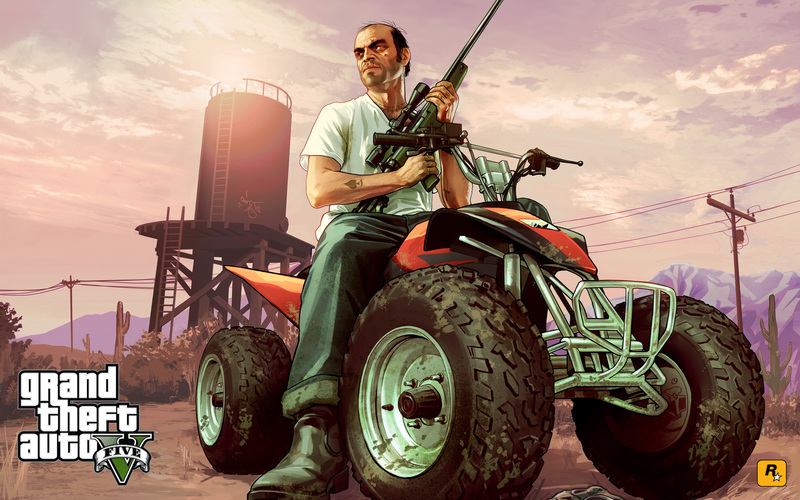 Rockstar Games released a statement giving a small amount of detail about the game. They then launched the official website splash page. 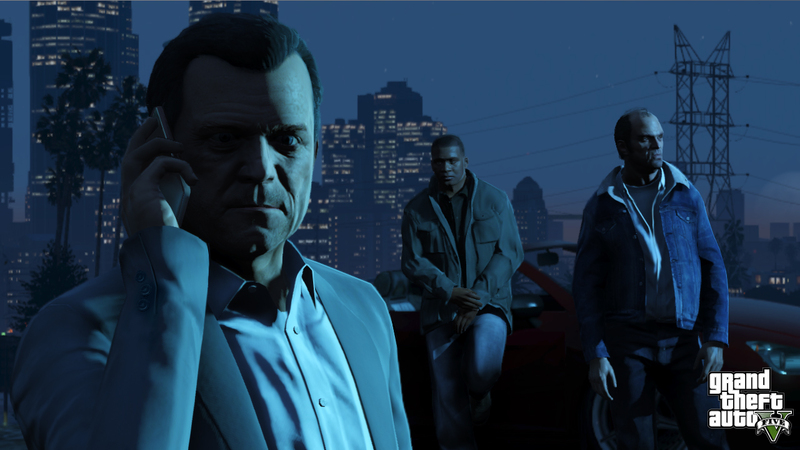 November 2nd saw the launch of the First Official GTA V trailer. 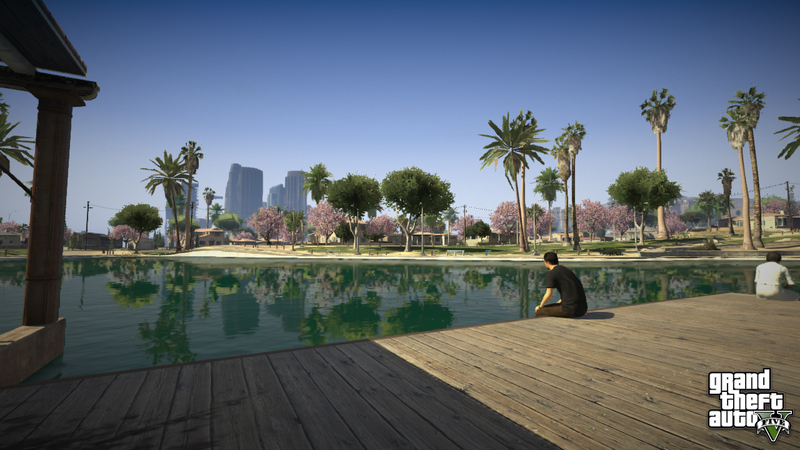 This showed off Los Santos, some of the countryside and a number of characters who may play important roles in the game. 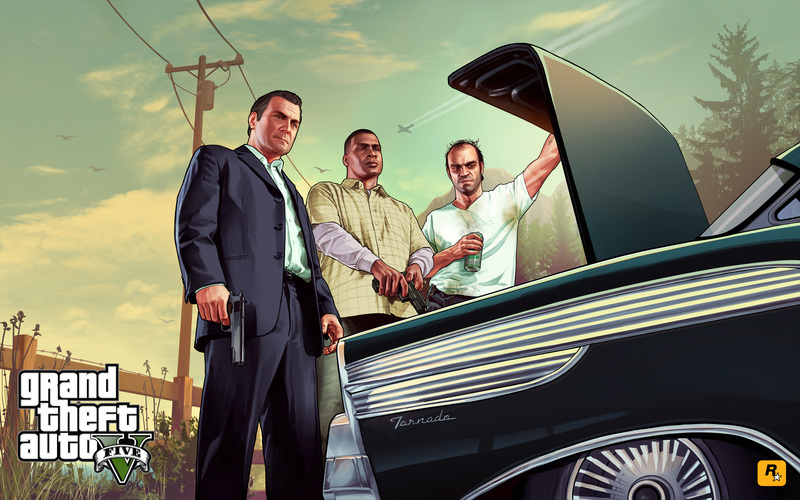 On October 25th, Rockstar Games shocked the world with a surprise announcement on Twitter. They simply posted the hash tag #GTAV and linked to their official website which displayed the GTA V Logo and gave a date for the first official trailer. 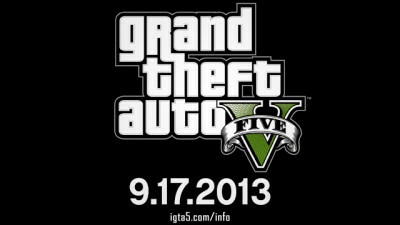 GTA V<3 comes out in 130 days its not that long now (-:. Typical Rockstar. They do it with every bloody game! If Rockstar employees are always this late, it will be a mystery on how they keep their jobs. I've been waiting for this game for a long time, and spring is coming up faster than I thought it would. I'm hoping an official, specific release date will come soon. 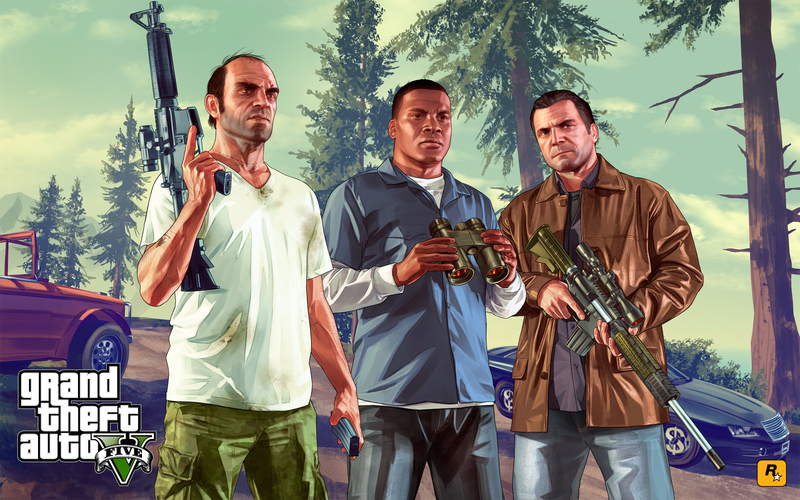 Grand Theft Auto 5 is going to be a big one. You're obviously new to the Rockstar Games realm. 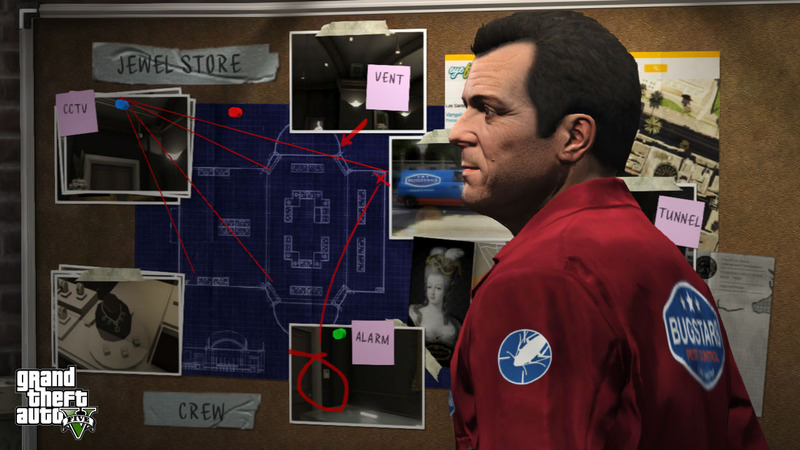 GTA 5 Launch Timeline - A look at major news events leading up to GTA V's launch and content released after.